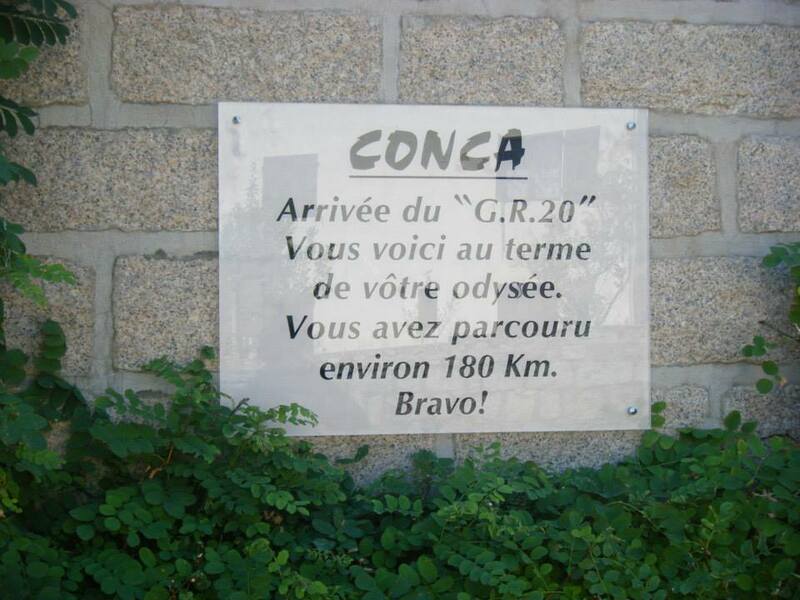 GR20 – days 11-13 – the end is in sight! 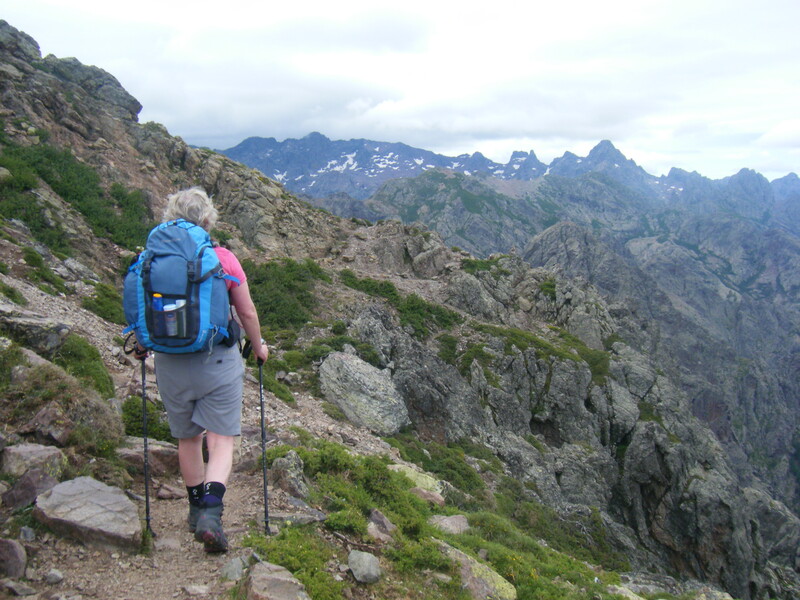 The last 3 days of the GR20 seemed to whizz by. 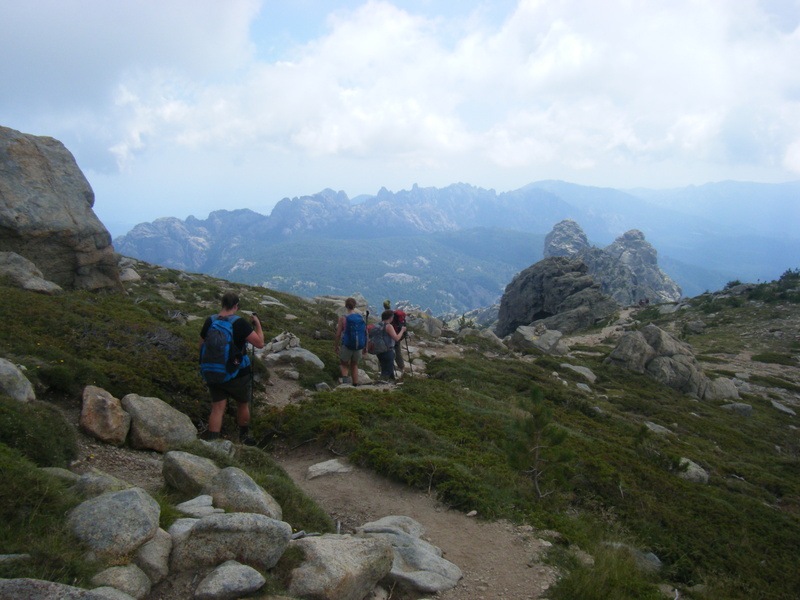 That said it was still a mental challenge; the weather was scorching hot and become hotter as we lost altitude each day, my ankle started to complain about walking and we were starting to play the food game too early in the morning (what do you hope we’re getting for dinner tonight? I really hope its a huge salad with cheese and a massive chocolate dessert. No I really fancy ice cream, a huge bowl with chocolate sauce – you get the picture). 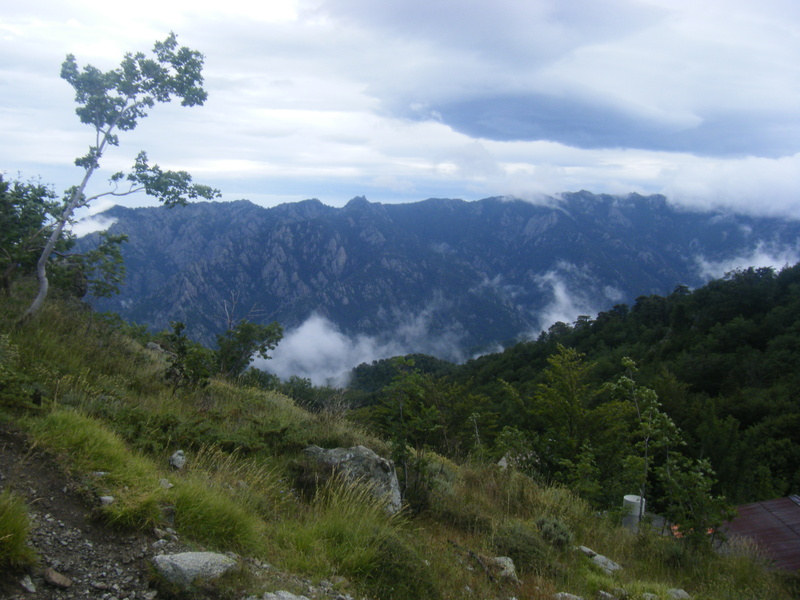 The ascent out of Cozzano village was brutal and we’d had to wait til 8am before we could leave as one group member wasn’t well enough to join us for the day and transport needed to be organised. So it was scorching hot as we tackled the track through the woodland out of Cozzano. My ankle was already not happy and while I’d been using poles up to today just to get down hill safely, now I was using them uphill too. 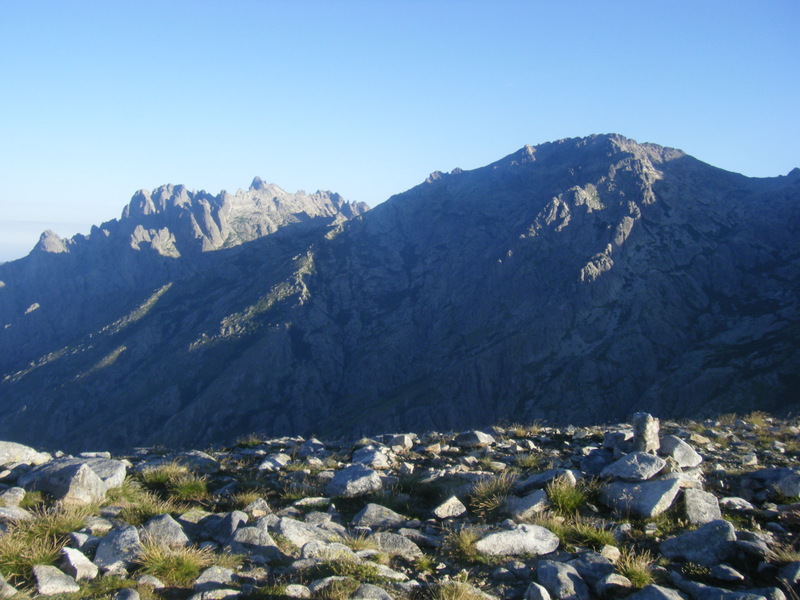 I have to be honest it seemed a bit unnecessary to have to regain over 1000m ascent back up to the GR20 path, just for a night at Cozzano. 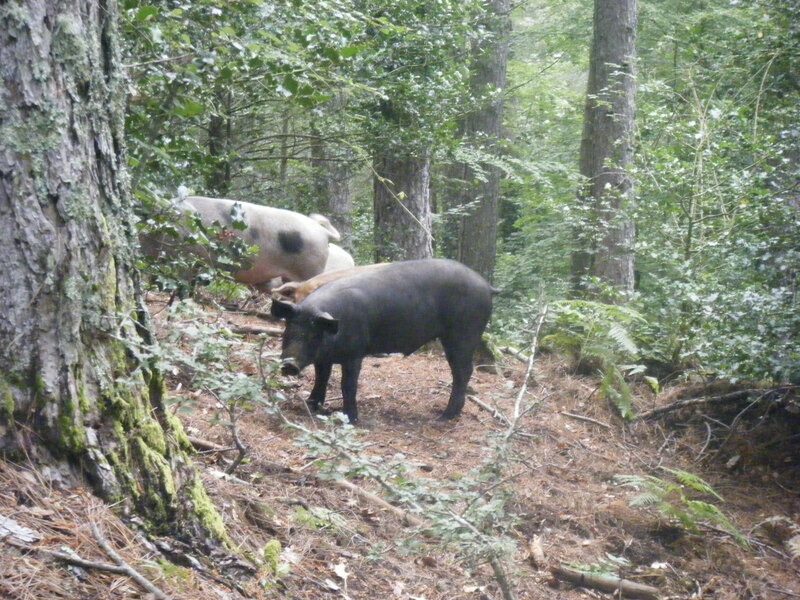 But we did, but not before we’d battled through waist high undergrowth and said hello to more wild pigs. 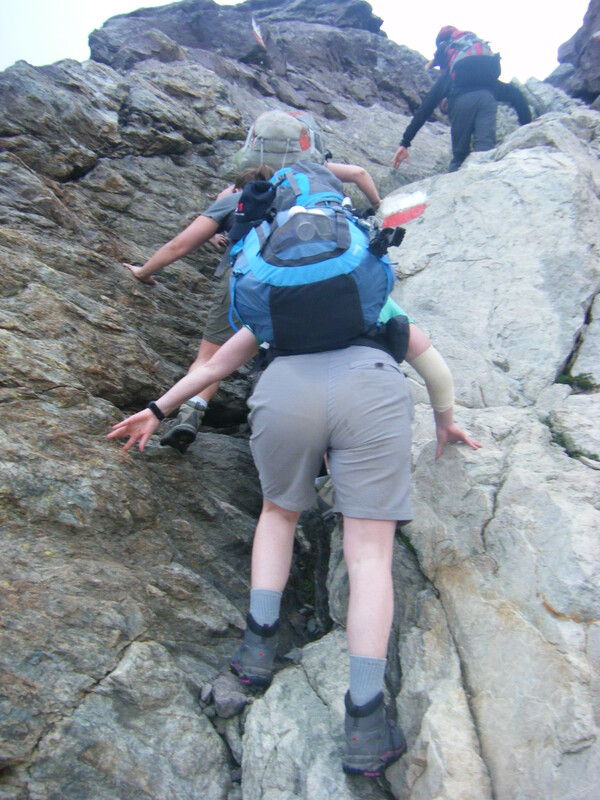 So when we got onto the ridge we were pleased for a break, thankfully the path across the top is easy to follow. 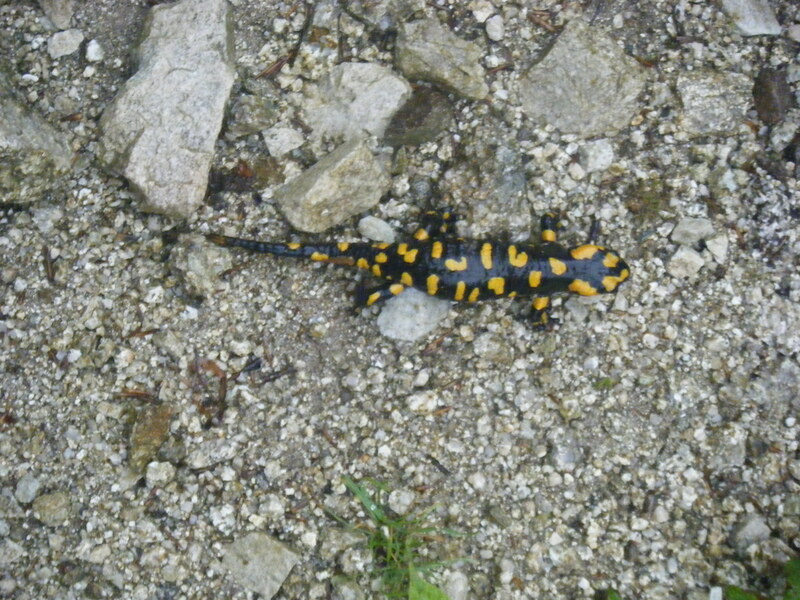 Actually we didn’t stay on the GR20 for long as we were staying at a private refuge at Crocce. 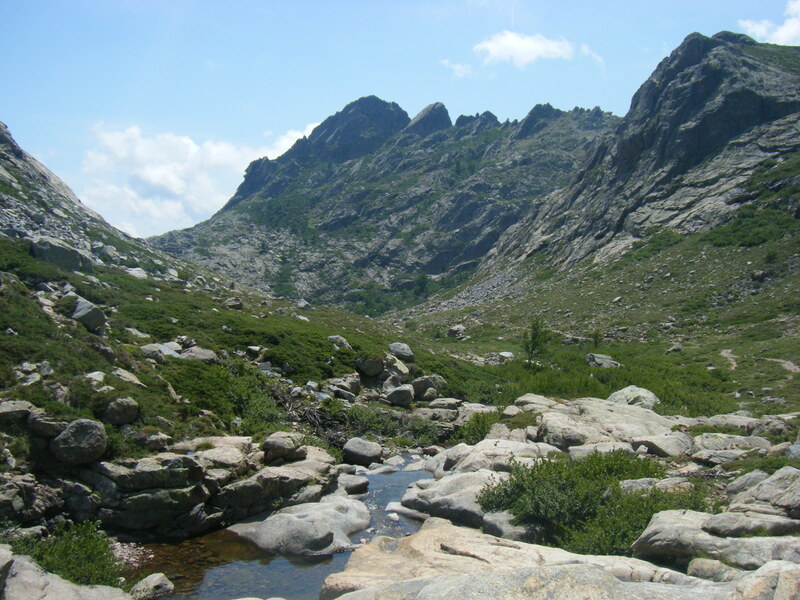 So when we reached the plateau at Bocca di L’Agnonu we stopped for a long lunch in the shade just near the water source and then followed the path by the river (another stop to cool feet) before heading for the refuge at Matalza for a cold drink. 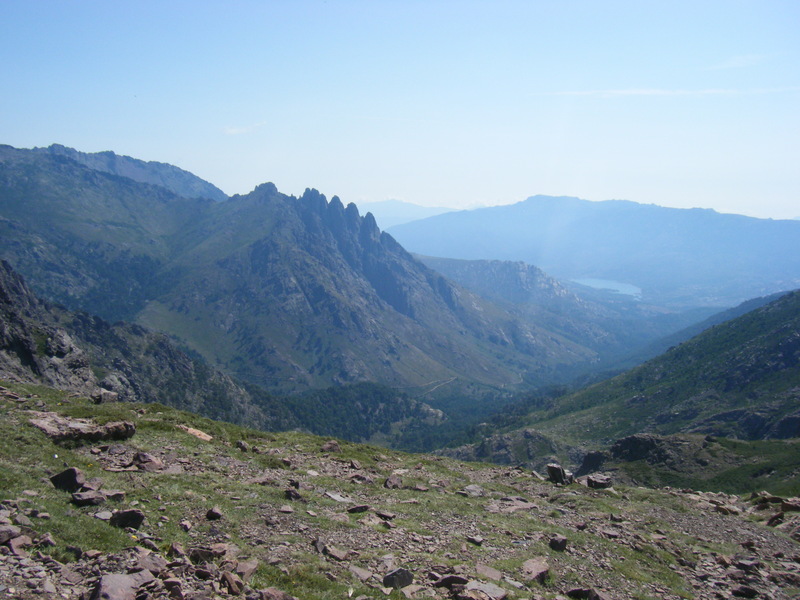 The terrain across the plateau is nothing like the rocky terrain in the north and if you do only half of the route you are certainly missing out on the stark contrast between the rocky mountains surrounded by pine woodlands in the north and the pastures and pinnacles in the South. 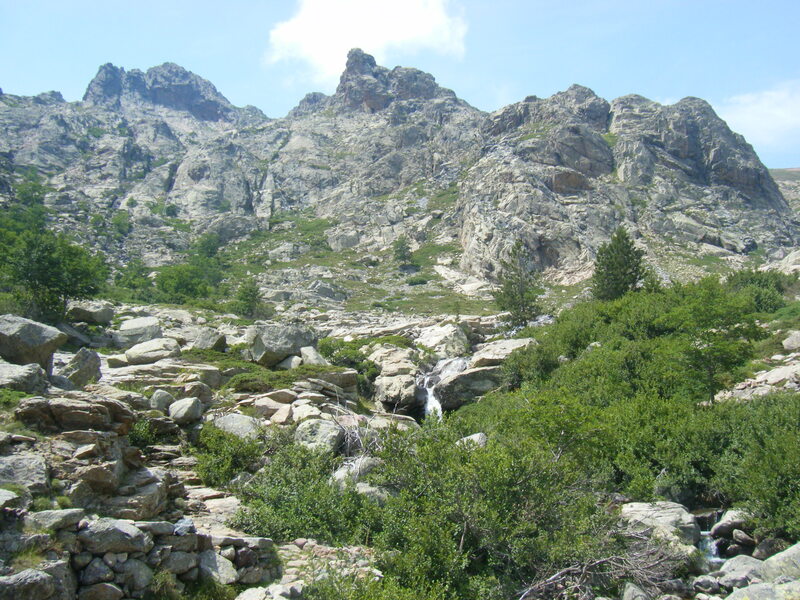 The route from Matalza to the Bergerie de Crocce is a wide track suitable for vehicles and so was easy to follow. While Crocce is a private refuge it is clean and in a great location and even has hot showers which was a novelty for such a remote place. 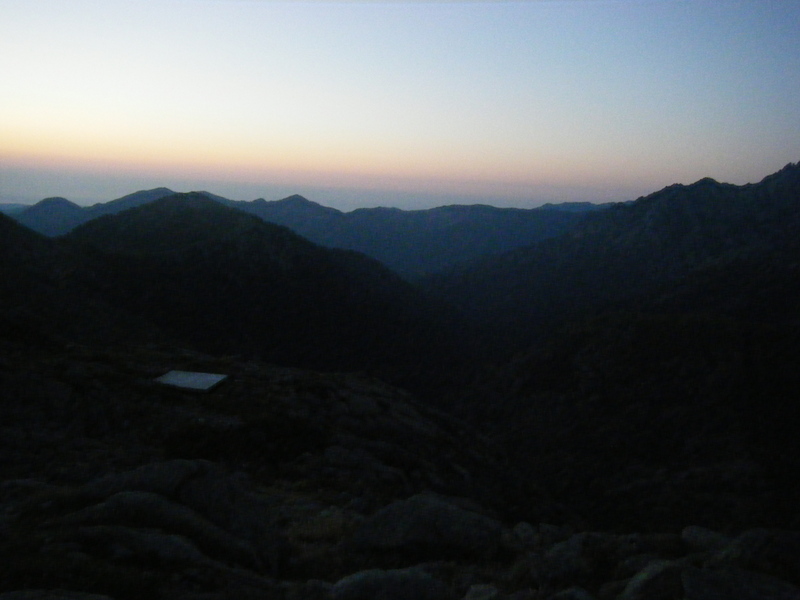 We had great views of the sunset as we relaxed with beers and later that night when nature called I had fantastic views of the stars and milky way. 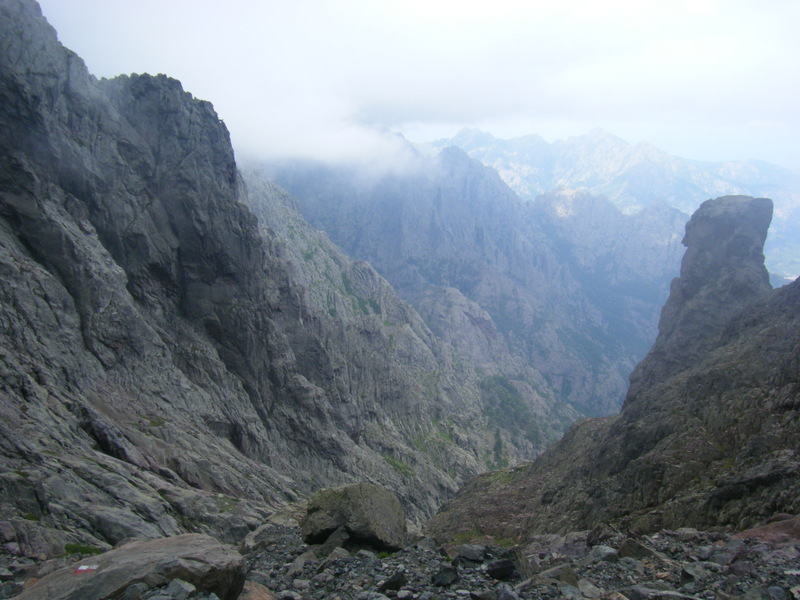 After a false start this morning when our guide left his mobile behind and realised half an hour into the walk and had a mad sprint back for it, we had a relatively easy ascent up to Monte Alcudina from Crocce, reaching the peak from the south west direction rather than non the GR20 path. The sun was already hot and the views amazing. The descent down to the refuge d’Asinau across steep rock and boulders shattered morale as much as knees as we lost 600m in a short distance, so a drink was needed when we reached the hut at 11am. 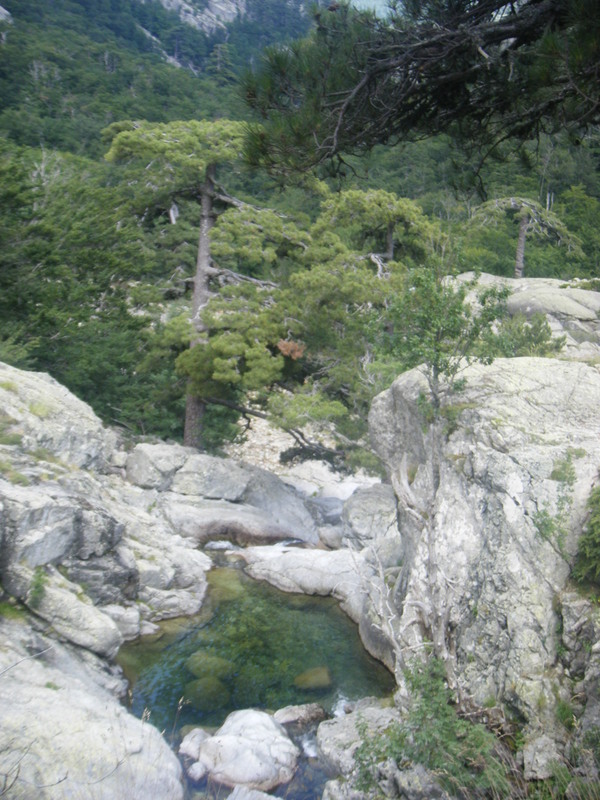 From there we continued to descend the steep path to the river where we stopped to cool feet and have lunch. Eventually the path becomes easier to walk as it winds through the woodland, that is until we reached the junction with the ‘alpine’ path. 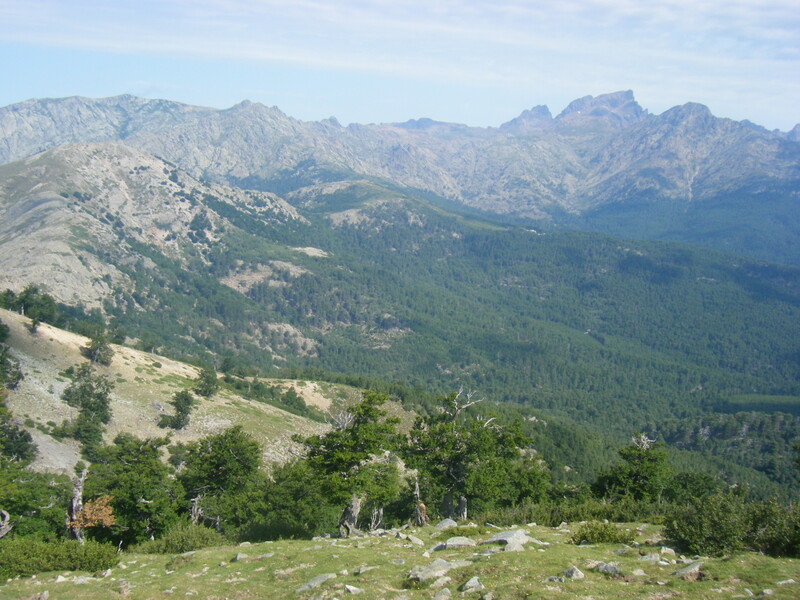 Once again, we took the higher level option rather than staying on the main GR20 route which headed through the woodland all the way to Bavella. 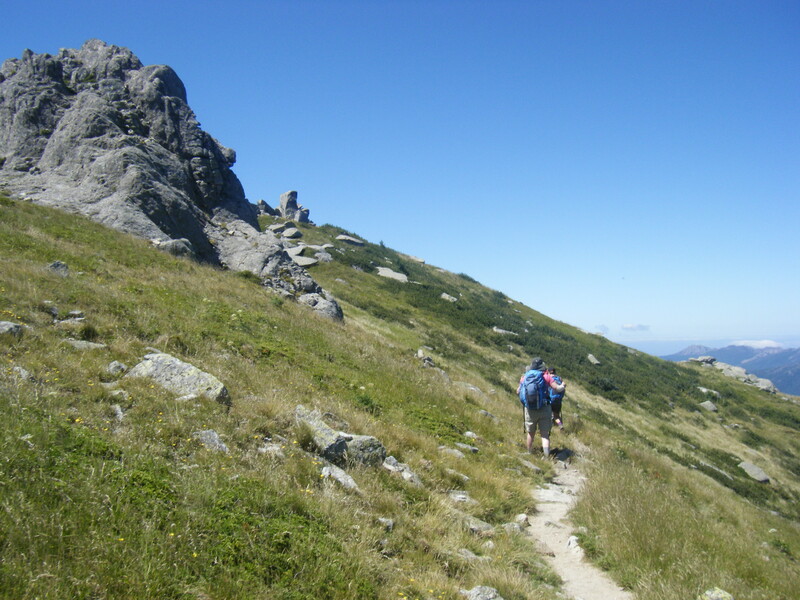 The ascent of the alpine route was steep and not really what any of us fancied in the afternoon heat as legs were tiring. But it was worth it when we got to the top. 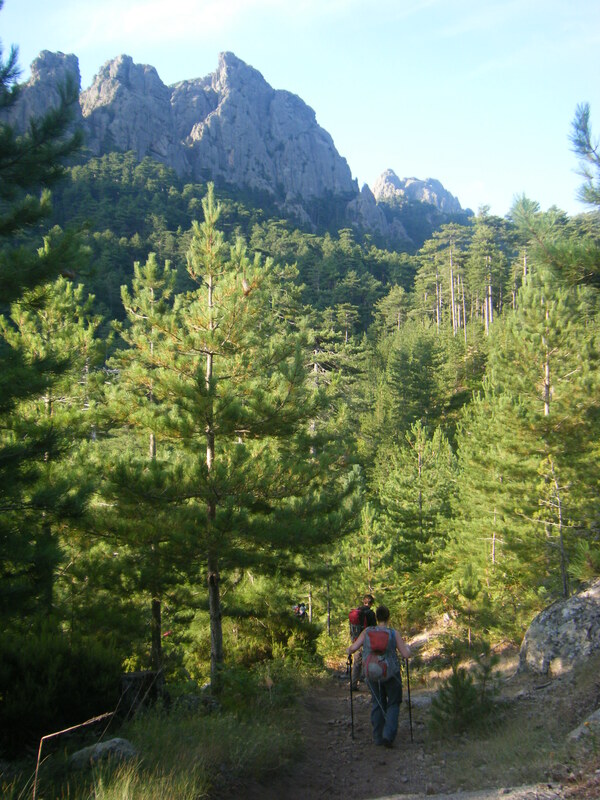 The path zigzags up the hillside towards to towering Pinnacles of Bavella. 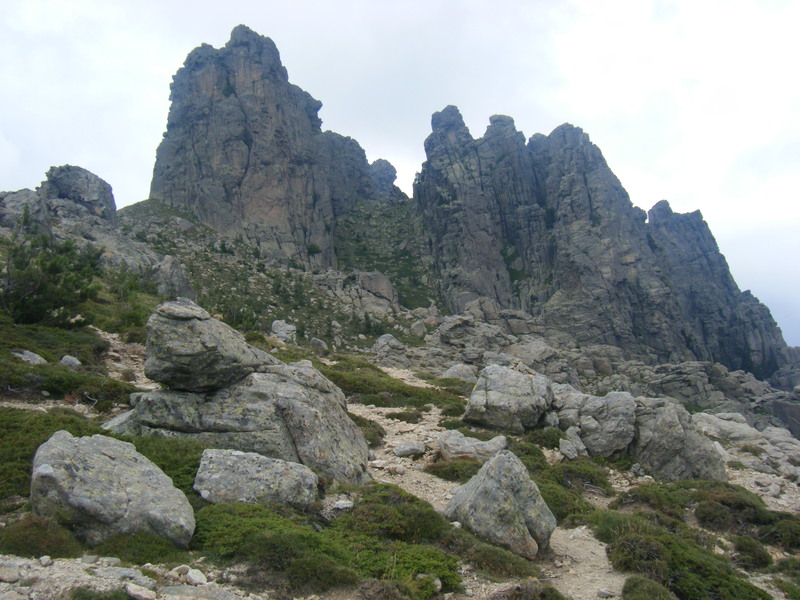 The path eventually heads right around the rock towers and we stopped on the small plateau top for a break at the foot of Punta di u Pargulu. 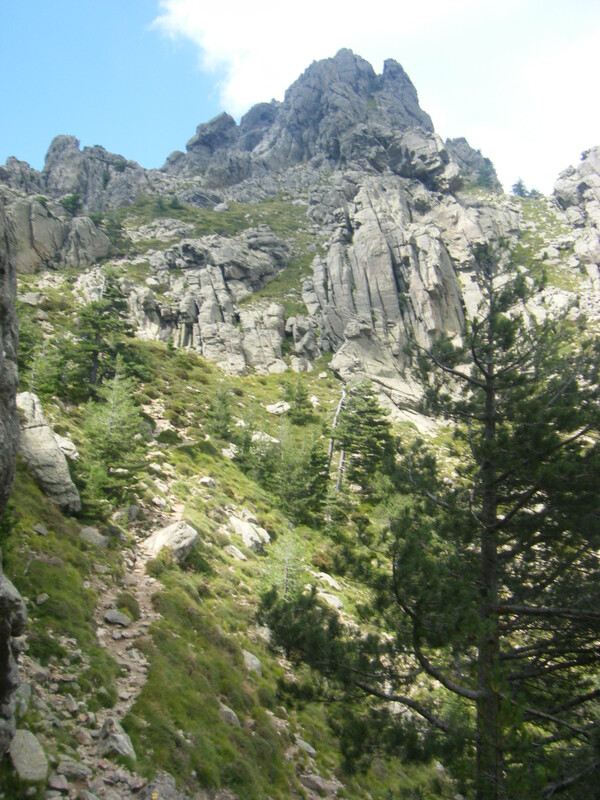 From the plateau the path then starts to descend down a boulder path. 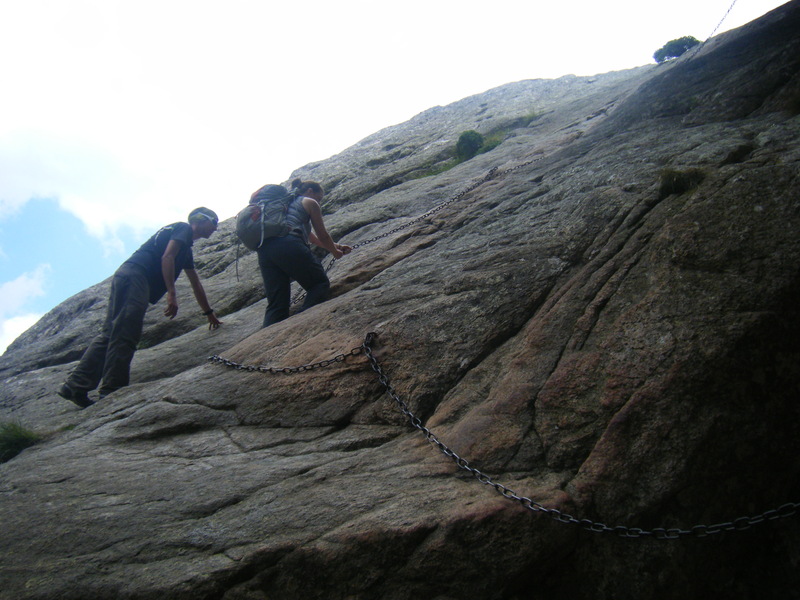 Once we reached the tree line we had one final chain to use to ascend a rock slab and then continue our descent down to Bavella. We stayed in the Gite below the restaurant at Bavella which in all honesty was a very small room for 5 people and despite the location (next to a road and in a popular spot for short walks) it was not one of the better places we’d stayed. However it was a bed and a hot shower and the food at the restaurant was plentiful and good. 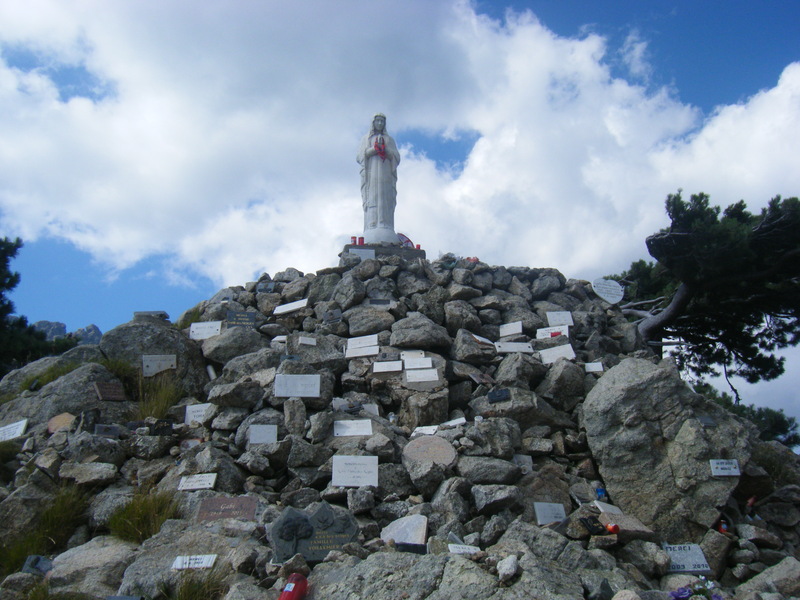 As you reach the road there is a large statue of the Notre Dame des Neiges. 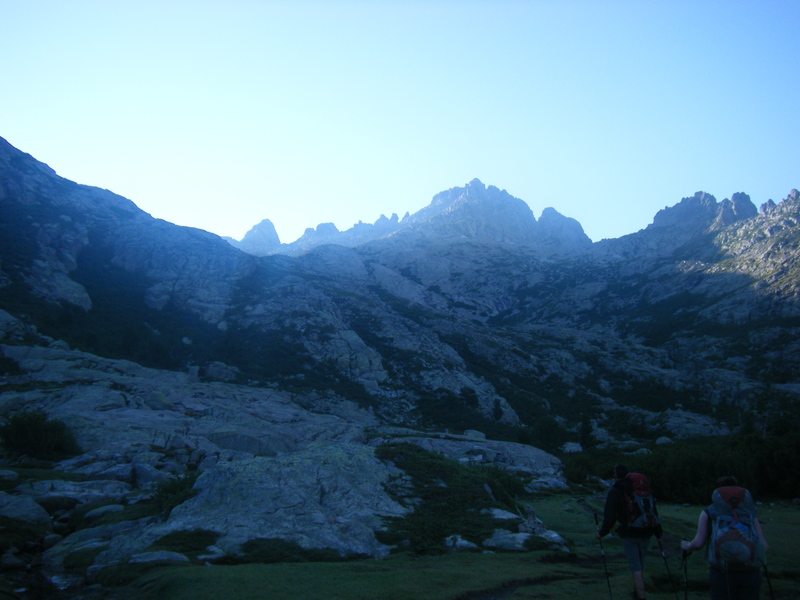 We started our last day heading for the village of Conca at the end of the GR20 in a good mood and not at all bothered for once that we were off walking at 7.30am. 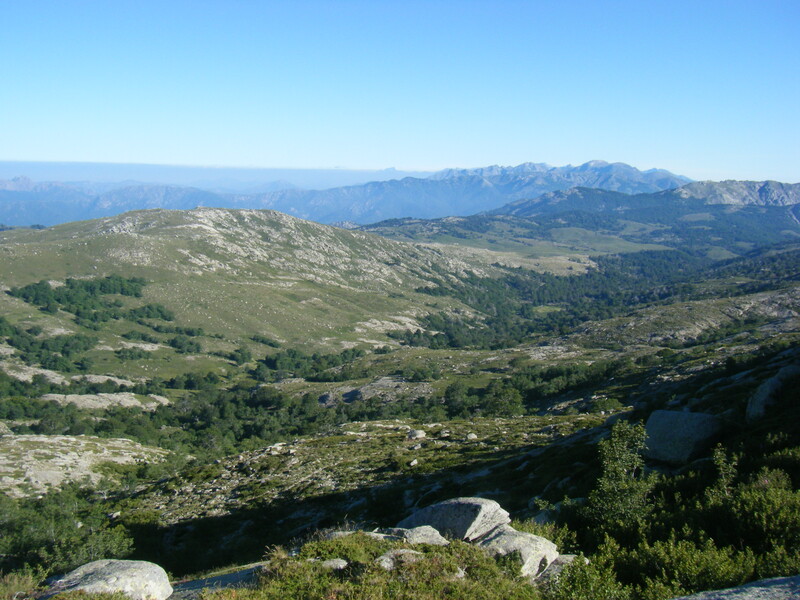 The route initially follows the track past the refuge at Bavella and through the woodland, and while it heads uphill it is an easy path to walk. 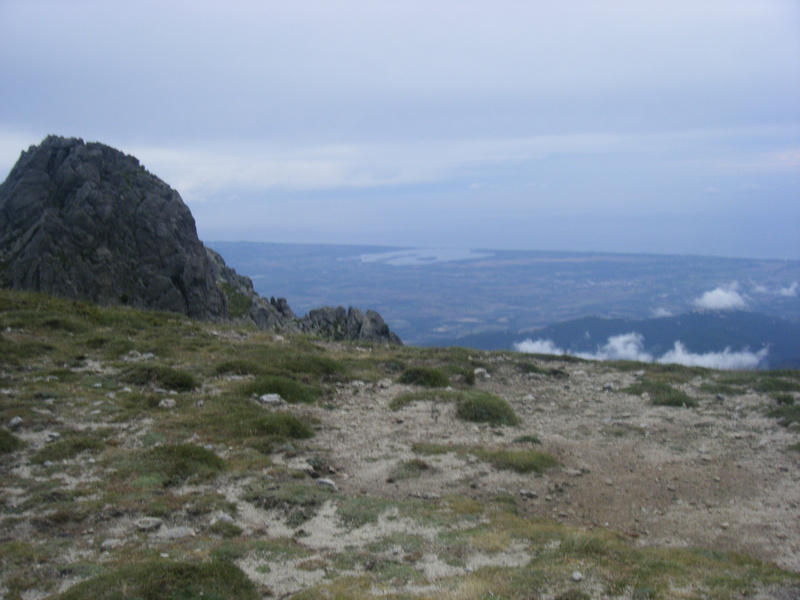 In fact the path was easy all the way to the refuge di Paliri. The path remains easy to walk for much of the day, although don’t be fooled that you are heading downhill all the way to Conca. 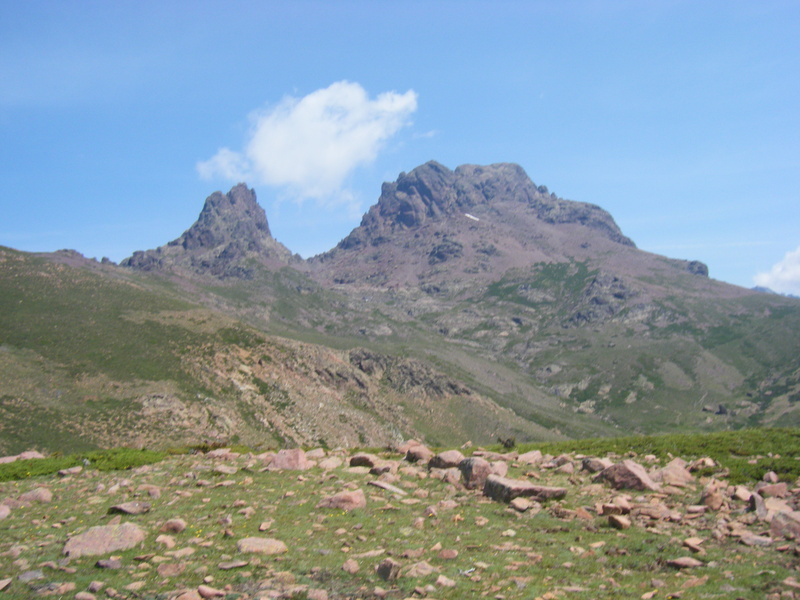 There is in fact three ascents today and in the scorching heat we didn’t appreciate them. 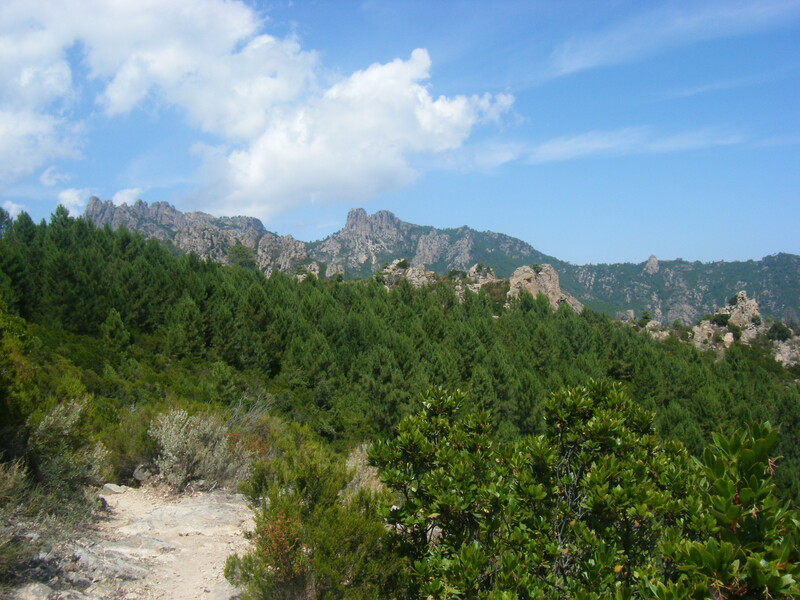 The views however were amazing, but with little shade as we walked through the ankle high scrub either side of the narrow path it was hard to appreciate it properly. 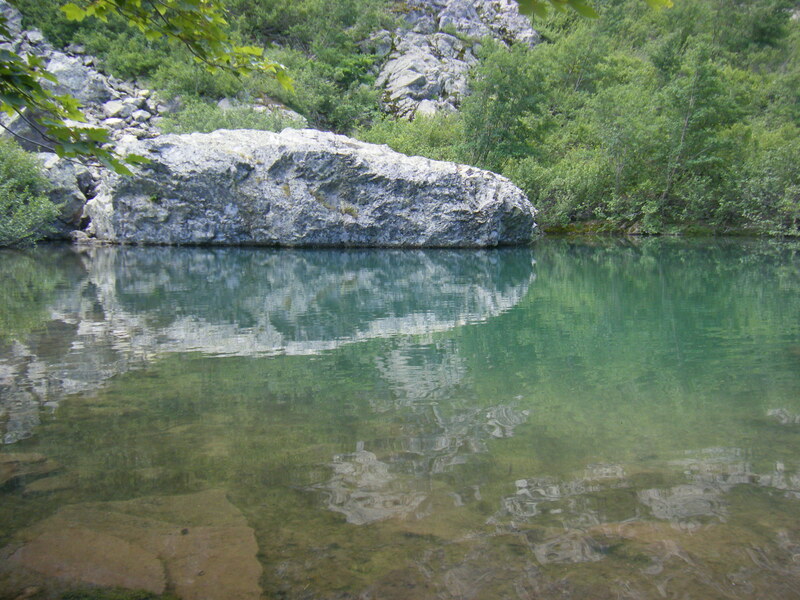 We stopped at the river to cool and have lunch and enjoy the shade before a steep ascent to squeeze through the rock gap at Bocca di u Sorta. 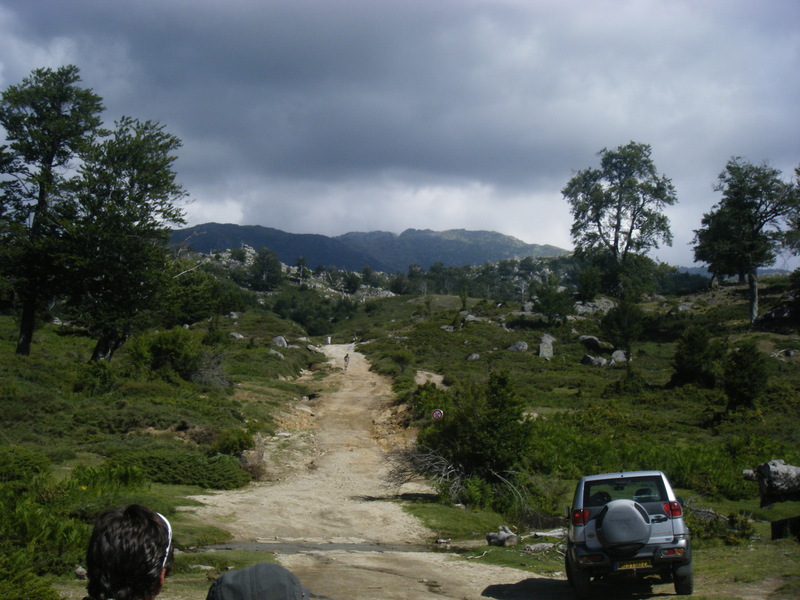 Eventually the path starts a gradual but endless descent down to Conca which lies at an altitude of 250m. 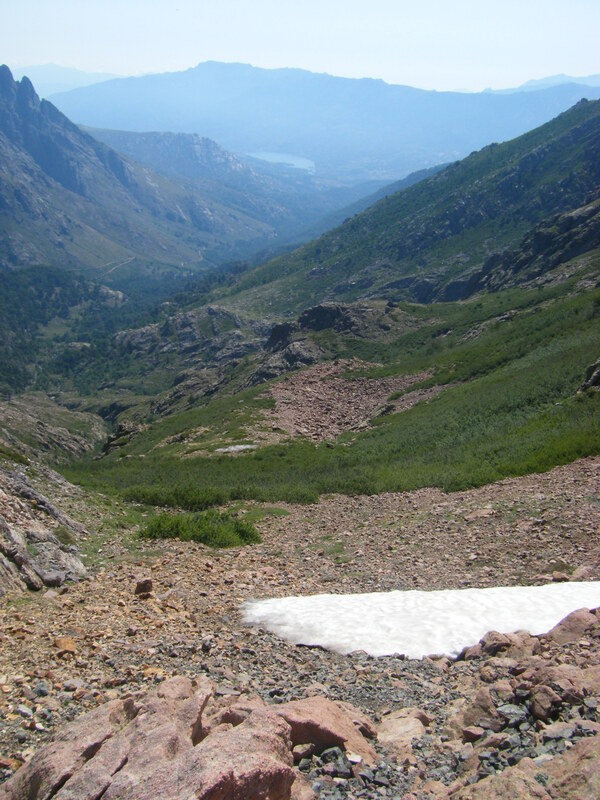 Even though the path is easier to walk than some encountered the descent is still tough on the knees. 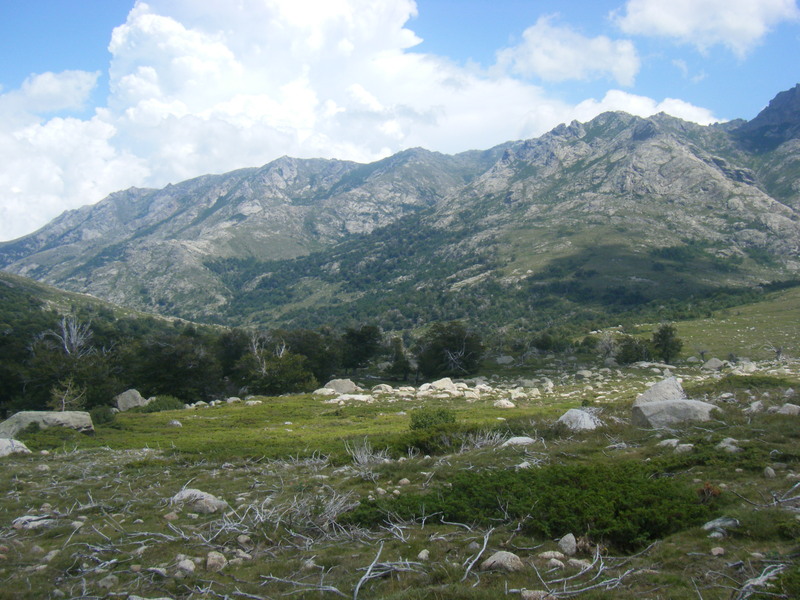 We were very glad to reach Conca even if we had walk through the village to the campsite to meet our minibus and had to rush our ice cream to start our 3 hour drive to Bastia for the night. 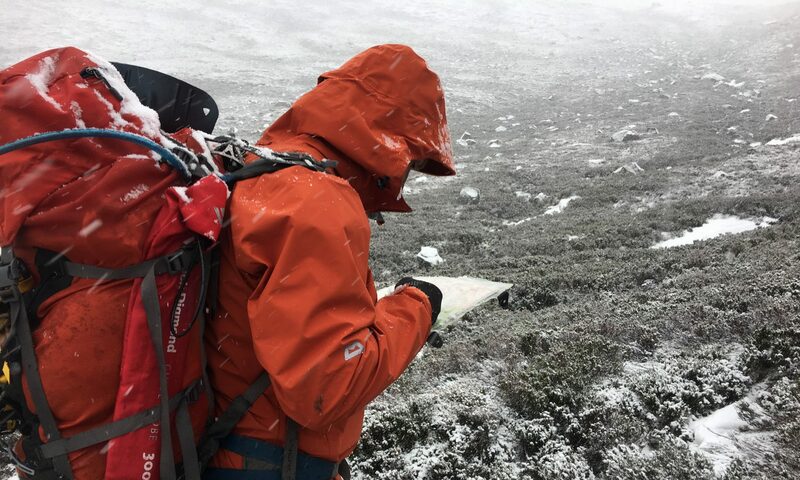 I thoroughly recommend the GR20 but would seriously advice reading the Cicerone guide to the route properly before heading off (unlike me who just looked at the pictures!) 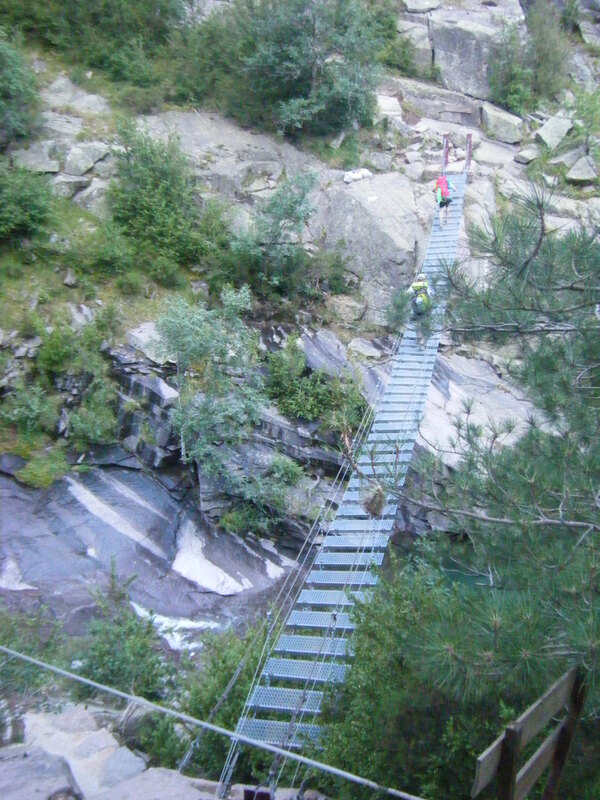 as the route is very challenging. I’ve done a lot of scrambling and long distance trails and I found this easily the toughest walk I’ve ever done. I also recommend walking poles to save your knees! As our trip was planned as 13 days of walking, we technically passed half way on our way to Petra Piana in terms of time, but there was still a long way to go. 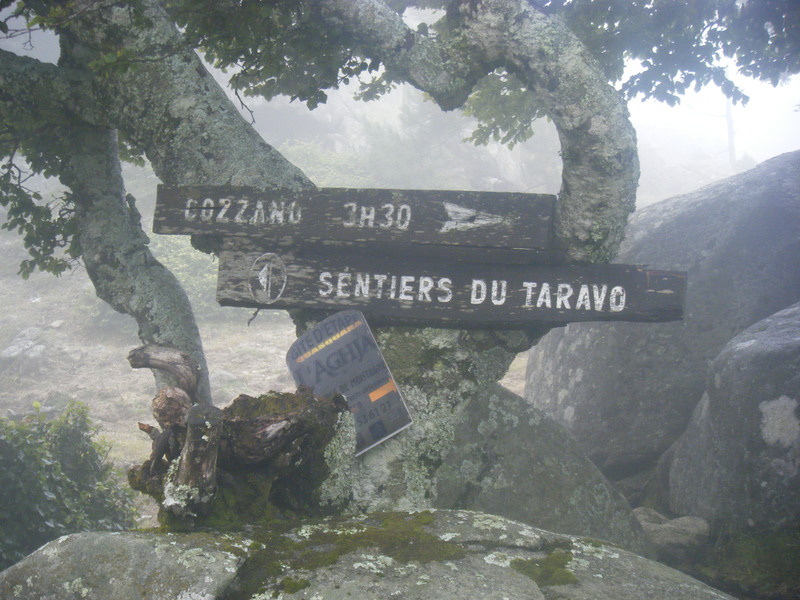 The town of Vizzavona marks the halfway point in the GR20 due to easy access by road. 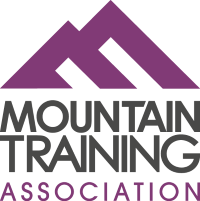 Therefore it also marks the point where a significant number of people drop out, largely those undertaking the challenge without a guide. 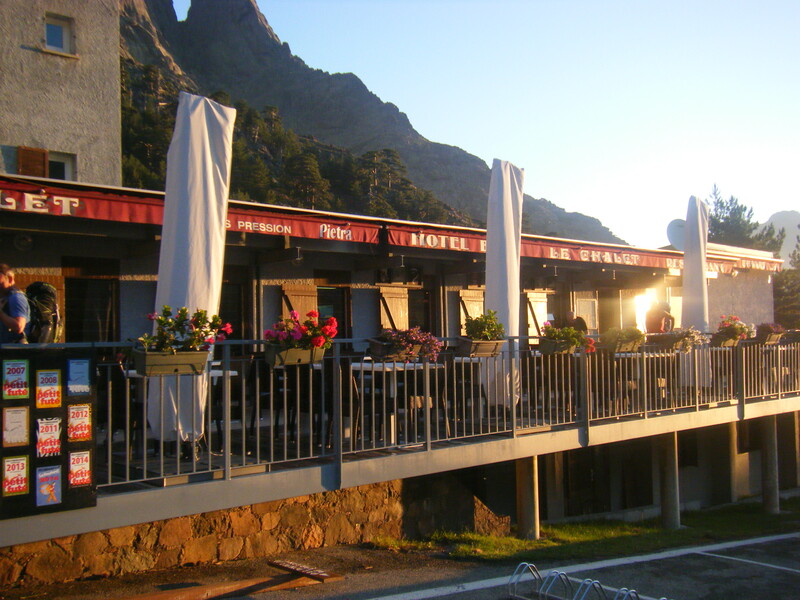 Its just to easy to stay in a hotel in Vizzavona and decide that the beach is a better choice for the rest of your trip. We however did not have that luxury, or any luxury at all as it happens…… from cramped tents and rubbish food at Petra Piana to bed bugs for one of us at Vizzavona. But we have to get there first…..
We left Manganu at 7am and immediately headed uphill. The path is steep and bouldery but not really challenging and there’s even a lovely flat plateau half way up with our first sign of mud on the route. 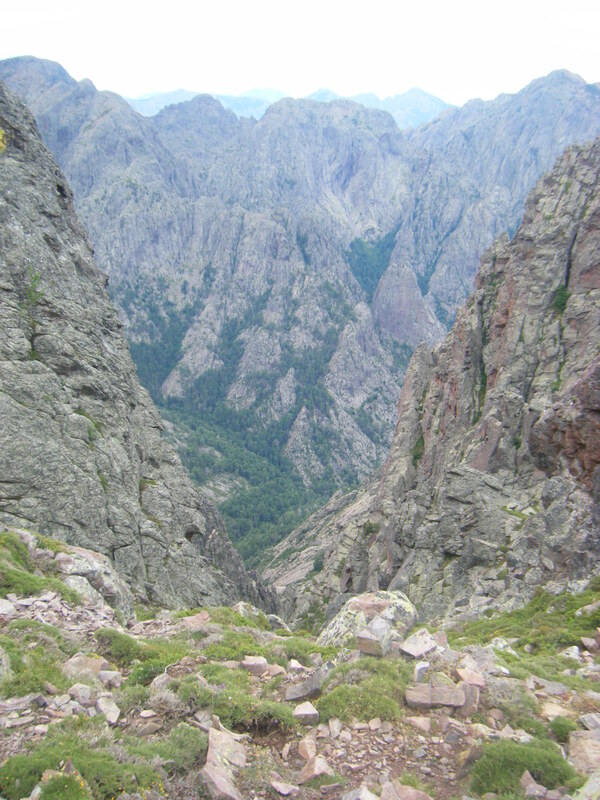 The route heads for the large notch you can see in the first photo and as it gets nearer to the top it becomes scree and boulders. 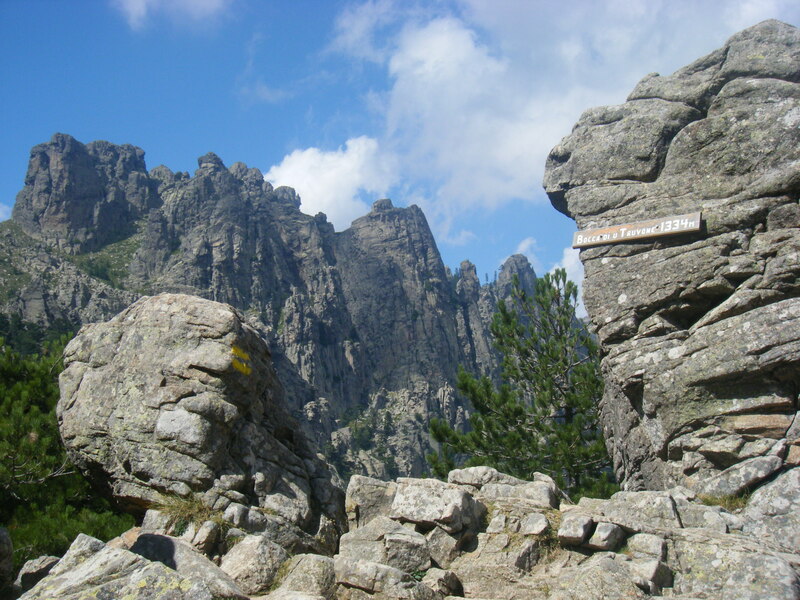 Its worth the effort though as this is Brecche du Capitellu, the highest point on the GR20 at an altitude of 2225m. Across the other side of the Brecche there is an amazing view which called for a second breakfast stop, which of course was shared by lizards. 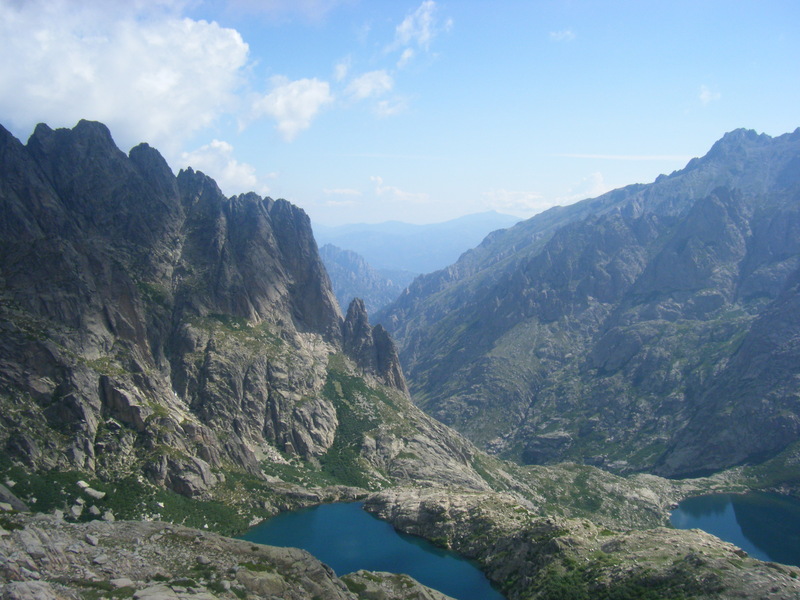 From here we could see Lac de Capitellu and Lac du Melu below and then onwards to the rest of the GR20 beyond. 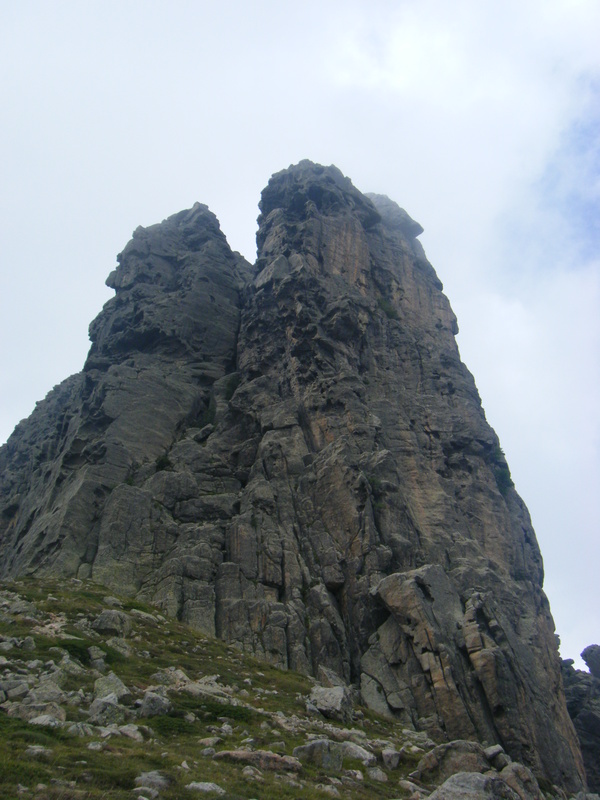 The route continues on, scrambling over boulders and rock slabs to circle around below Punta a e Porta’s rockface. 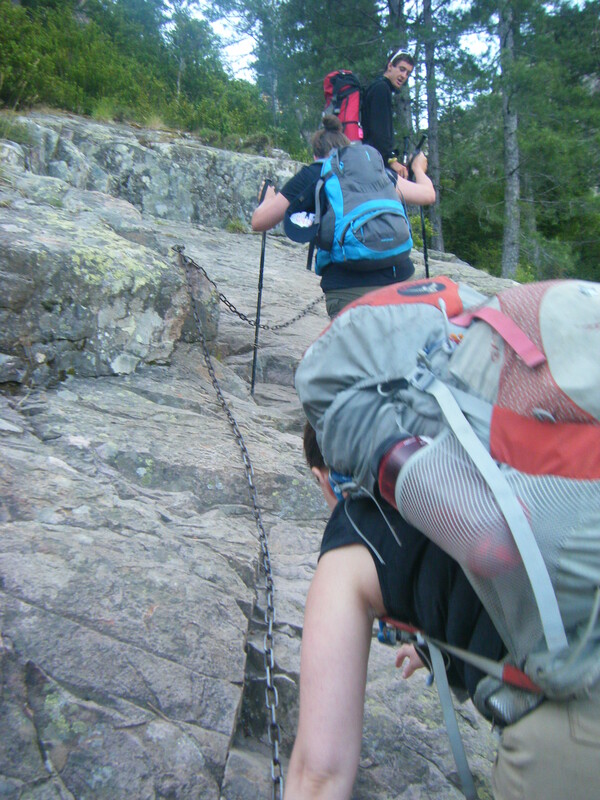 To reach the rocky notch which is the next col to cross, we had to scramble down a steep gully which has a chain added and then back up the other side. From the other side there is a yellow flash marked on the rock which indicates a diversion route down to Corte, a popular stopping place for some groups. 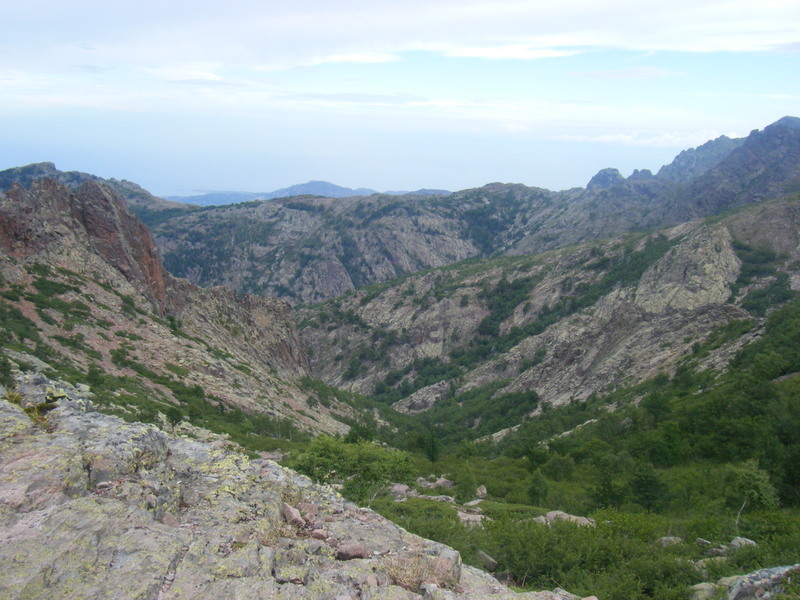 However, we continued to follow the white and red markers of the main route, which crosses a ridge and ascends up to Bocca a Soglia before the descent down to the refuge at Petra Piana. 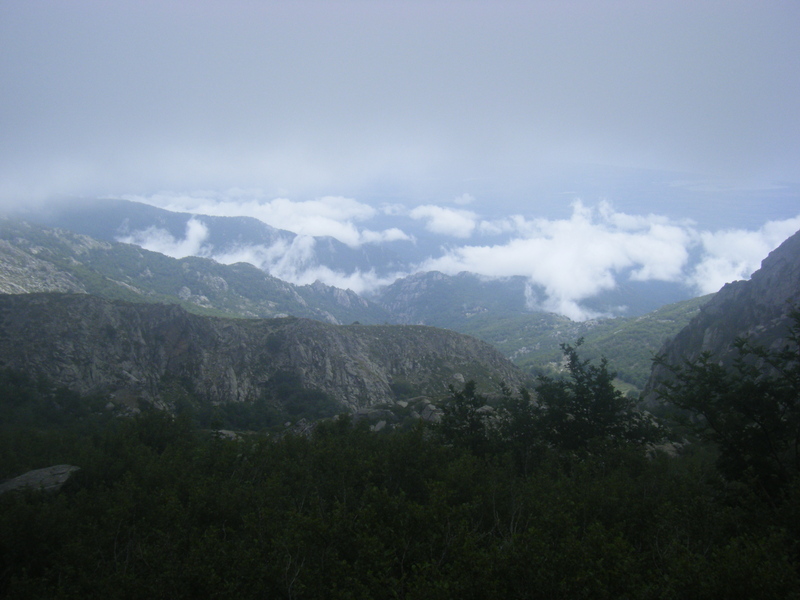 By the time we reached Petra Piana the cloud had descended and the temperature had dropped, which certainly added to the disappointment at finding the area surrounding the refuge was a sea of tents all very close together. Ear plugs were a definite must to get through the night! Petra Piana is also the only refuge on the whole route where as a vegetarian I really struggled to eat well. The rest of the refuges we stayed at were generally fine at providing an alternative evening meal (the same food minus the meat). Petra Piana however, outright refused to do an alternative, so the two of us who were vegetarians were extremely grateful to a lovely french couple who gave us pasta and sauce so we had food for the night. So be warned, the guardian of Petra Piana is not friendly to non meat eaters! 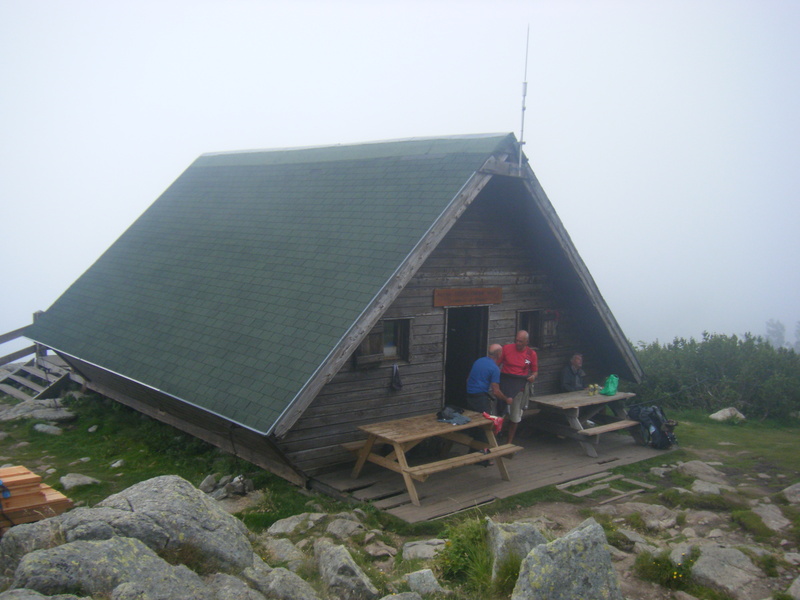 We also had to sit outside the very tiny refuge building to eat, and in the mist it was very cold and therefore a quickly eaten meal and an early night. It was dark when we awoke at Petra Piana, neither of us had slept well in our cramped tent and we were keen just to get moving and warm up as it had been a cold night. Breakfast was the usual bread and jam but thankfully we were able to sit in the tiny refuge kitchen to eat. 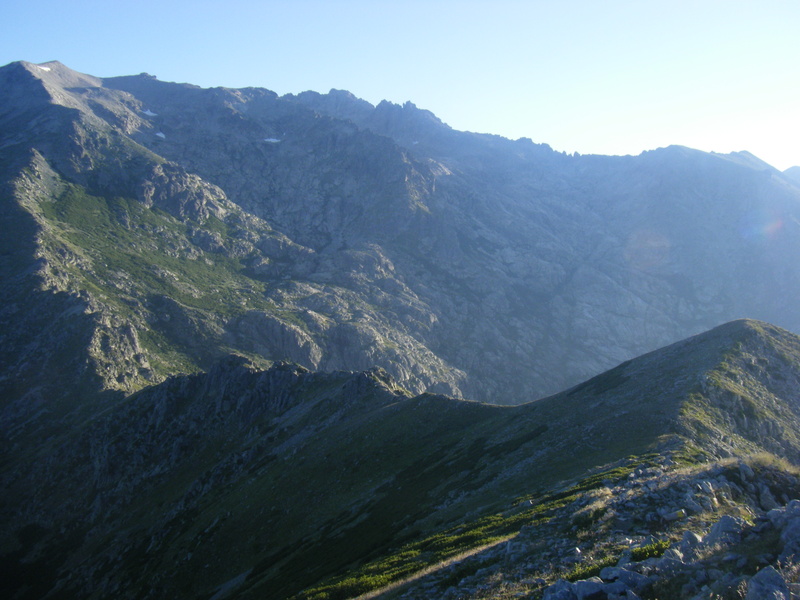 We set off walking at 6am as not only were we taking the higher level route across the ridge, but we were also carrying on to Vizzavona, making this a day of 2 legs of the route condensed into one. 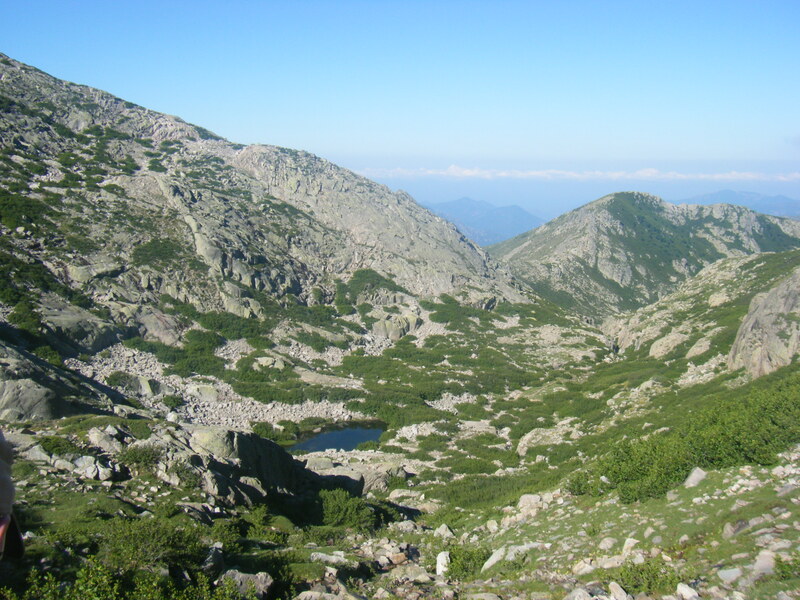 The higher level route is shorter and actually involves less climbing so if you’re going to combine two days into one this is an excellent spot to do it. The higher level route is an alternative path to the main GR20 and while I’d booked this particular trekking company for it being the only one which did the whole length of the route, it was certainly worth taking the ridge route for this section as the views were fantastic and much better than any woodland would provide. From Petra Piana we followed the yellow paint markers up to Bocca Manganellu, and along the way to the ridge we saw the sun rise and the view across the ridge we where to walk along. The ridge is easy to walk with little scrambling and little exposure, although it was quite windy. We stopped briefly along the ridge for second breakfast out of the wind and to admire the view and the rest of the route we’d be taking. 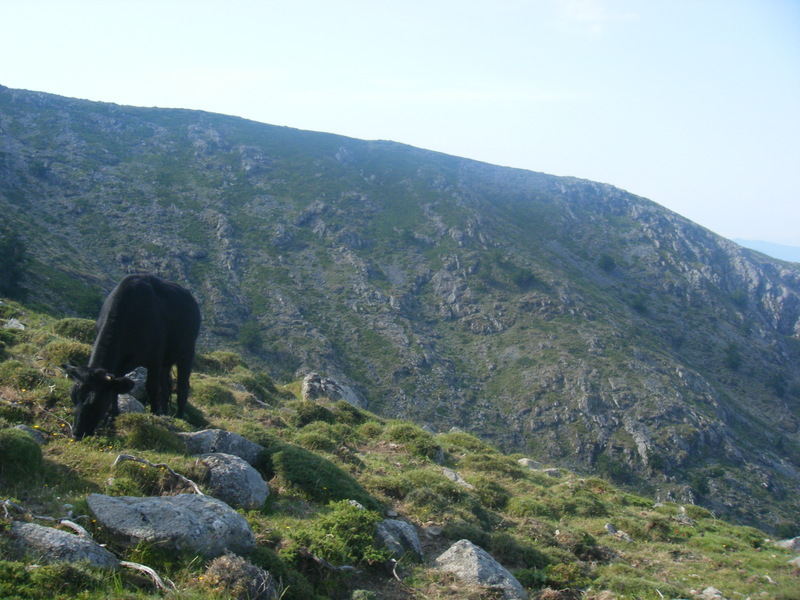 The ridge is a fantastic walk and provides the first point on the route where you can see the sea on both sides of the island. 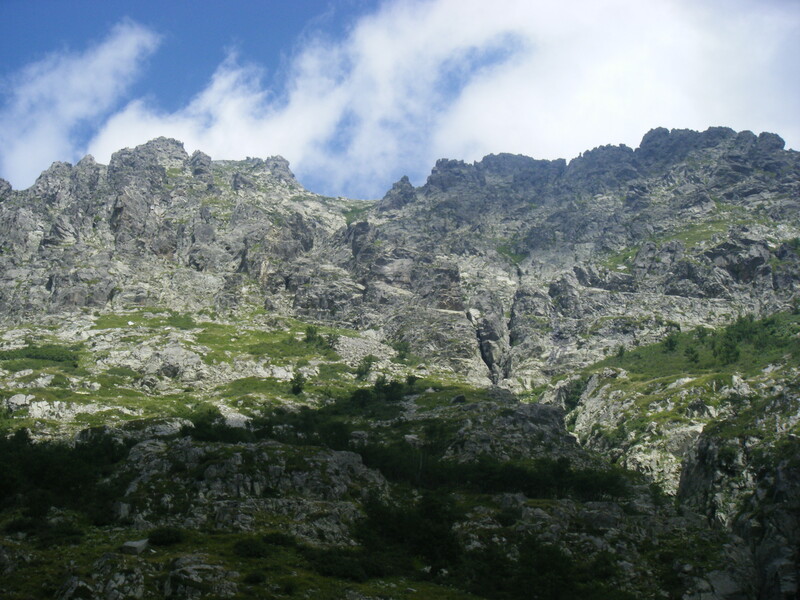 Taking this route also provides an opportunity to bag the peak of Punta di I Pinza Corbini at 2021m. 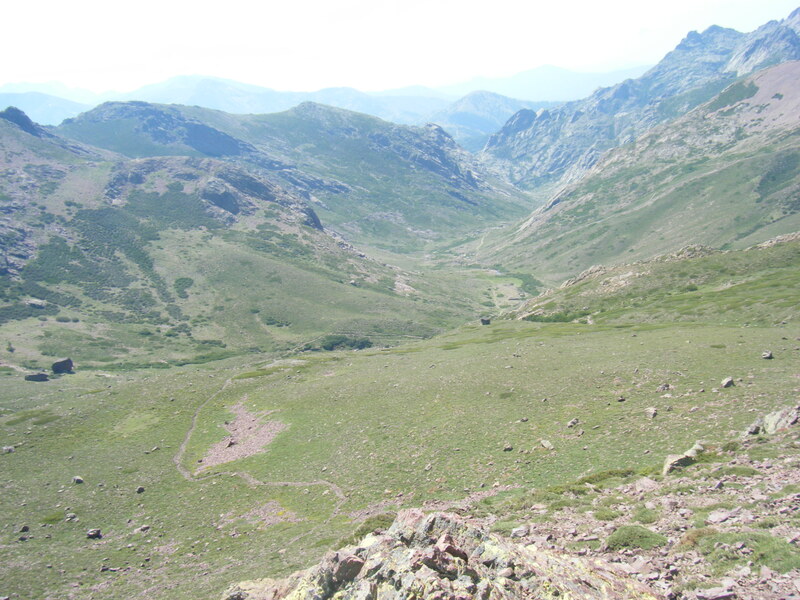 The path descends gradually to the point where it meets the main GR20 route, just above refuge l’Onda which took us about 4 and half hours. 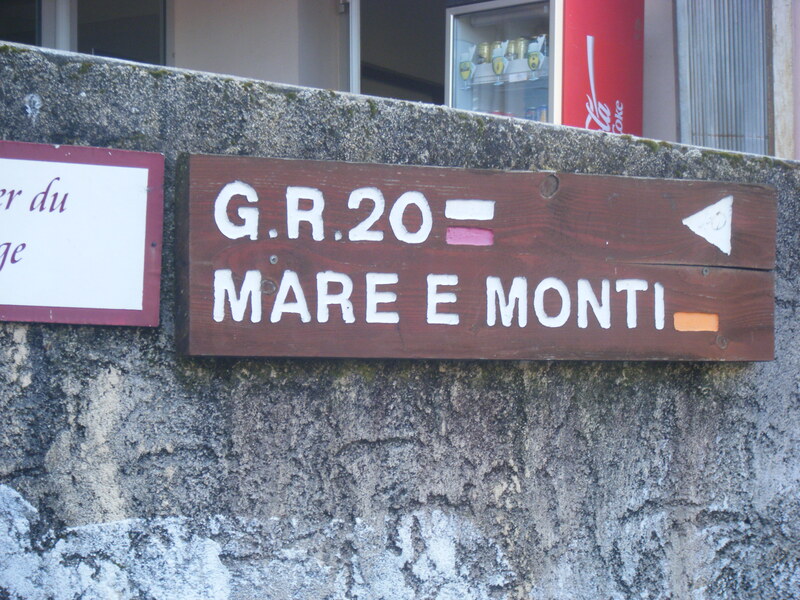 We didn’t head down to the refuge but picked up the main route and headed upwards for our strenuous ascent of the day to skirt around Punta Muratello. 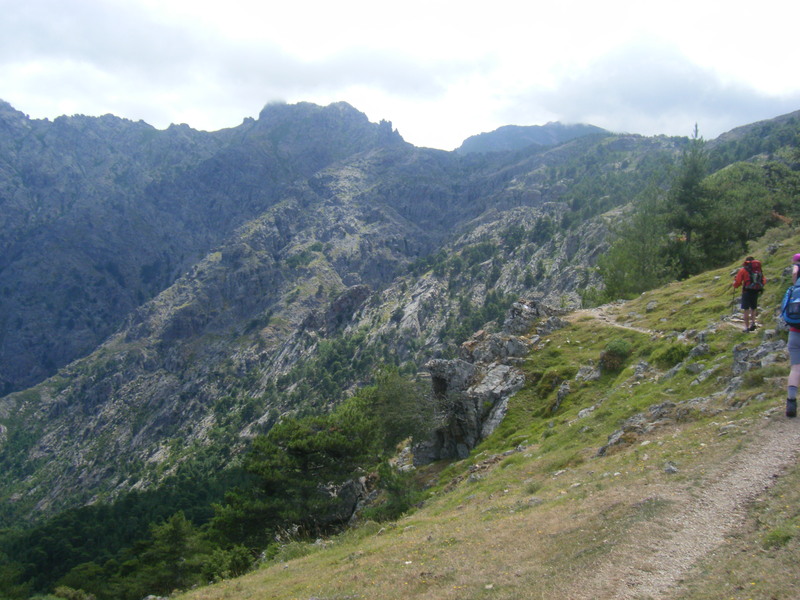 It seemed straight forward as we headed from l’Onda up the ridge, but the path is steep and winds through juniper and shrubs and eventually becomes rocky and scrambly as it turns left and heads up through bare rock to the pass. 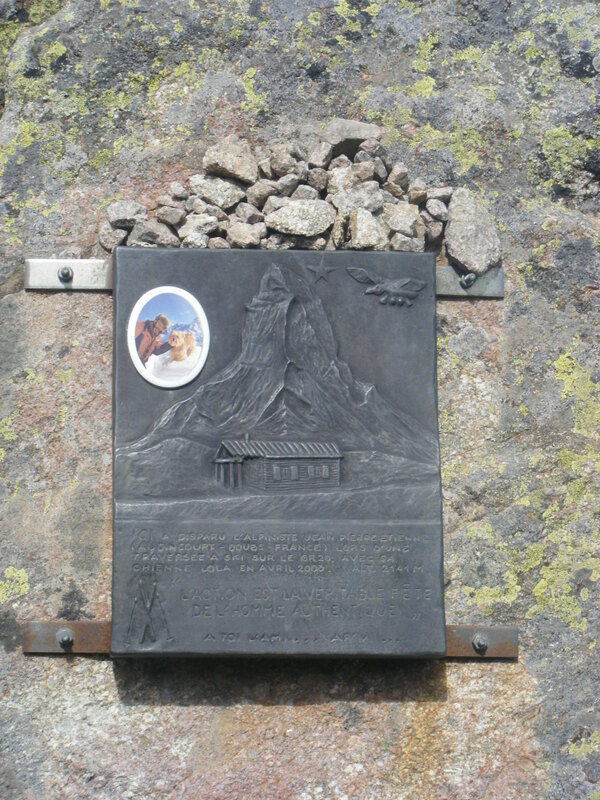 Along the way you pass a memorial to a fallen mountaineer. 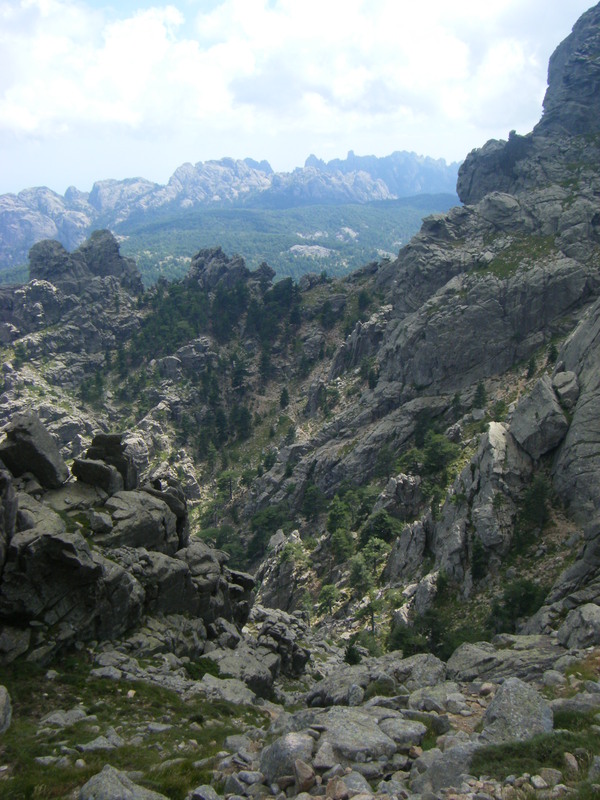 As the path descends down the other side there is a lot of bare rock but nothing which really requires scrambling – and by this point we had perfected walking like Charlie Chaplin down the slabs. The path continues down to follow the river where we crossed a bridge, before heading through the woodland on an easy path to the road. 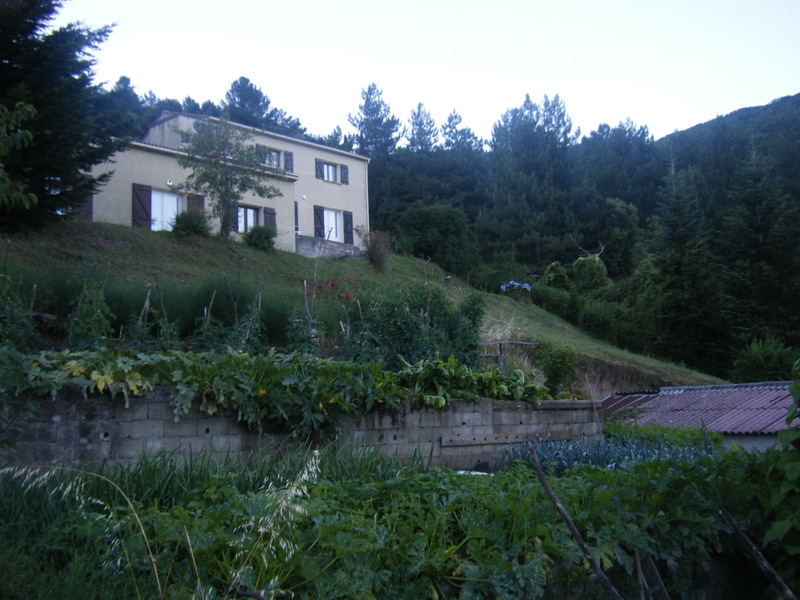 We stayed at the Gite Monte d’Oro just by the roadside in Vizzavona, another lovely place were we had rooms between three of us, with private bathrooms. The food was also amazing and a lovely bar for drinks and our nightly pint of Pietra beer. Unfortinately the only man in our group was the victim of bed bugs at Vizzavona but thankfully this was the last time any of us were so unfortunate. 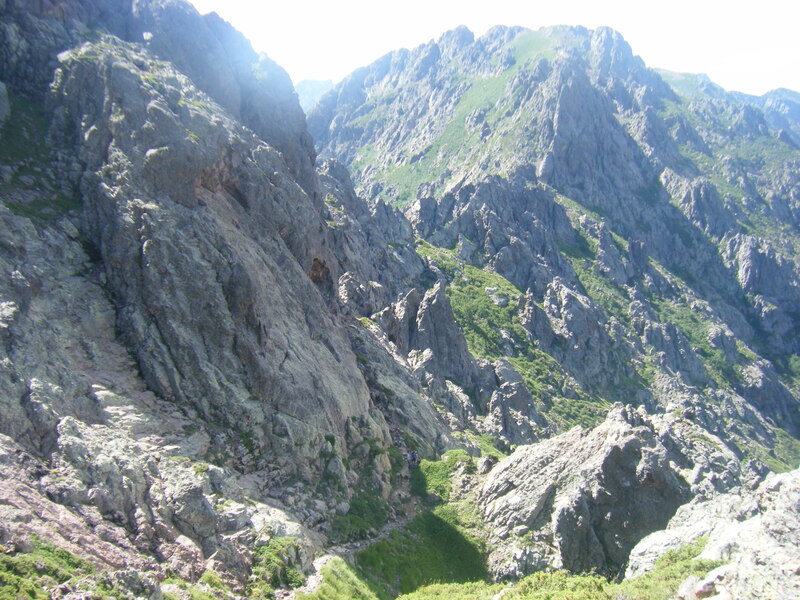 Its certainly easy to see why many GR20’ers decide to finish their trek at the half way point in Vizzavona. For us we had a nice bed for the night and another early start. 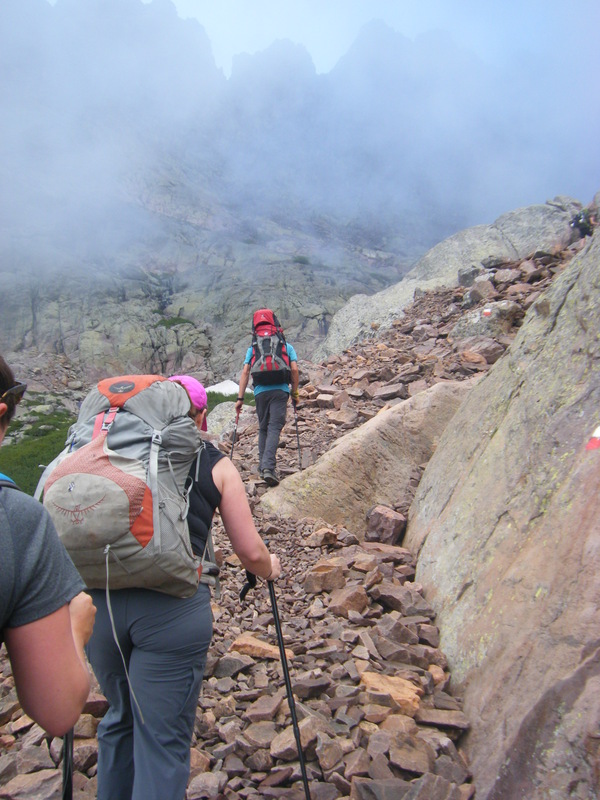 After the excitement and hardwork of the Cirque de Solitude we assumed that the hardest part of the route was behind us. 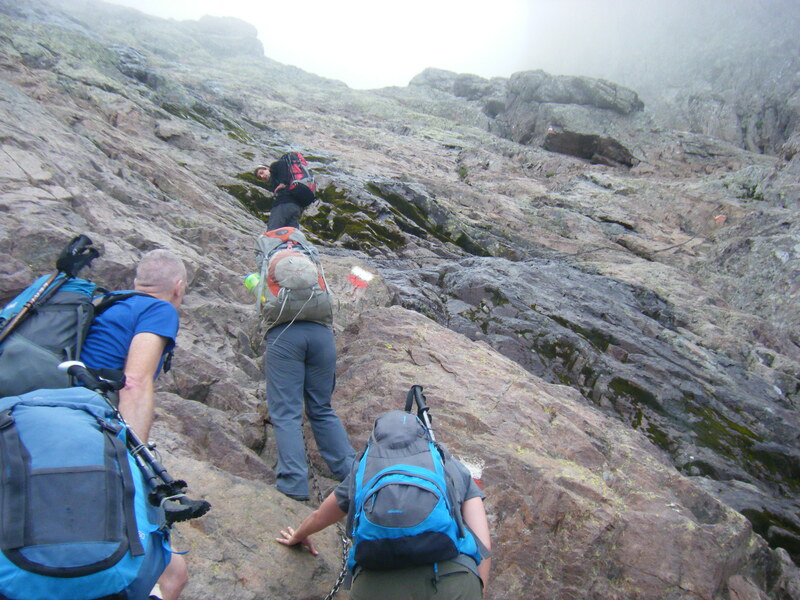 In terms of technicality we didn’t come across anything quite as difficult, but the pace was to pick up and the distances lengthen, tricky to maintain over bare rock, loose scree and still scrambling for the majority of the day. 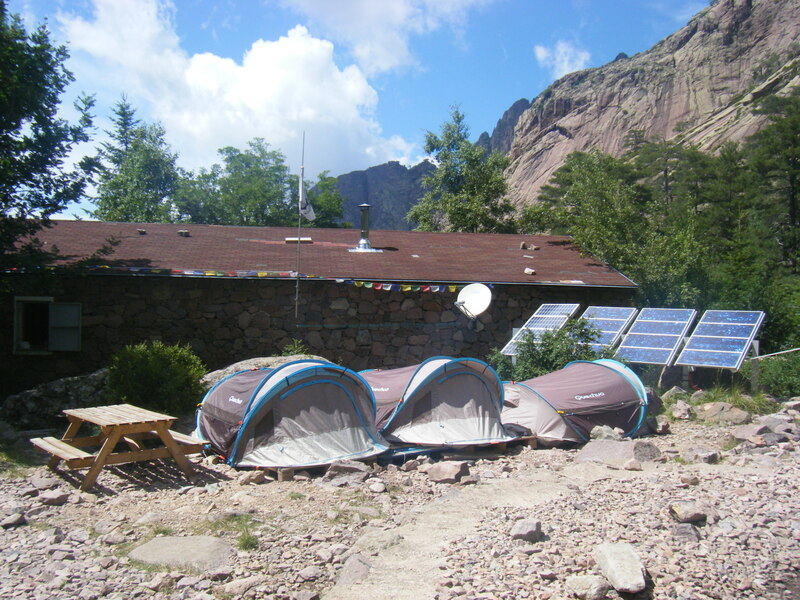 The pop up tent and thin mattress didn’t provide a good nights sleep on the bare ground at Auberge de Vallone. So I was almost glad breakfast was at 6.30am, and it was a nice surprise to find that this morning’s bread and jam was much nicer than we’d had so far at the refuges. 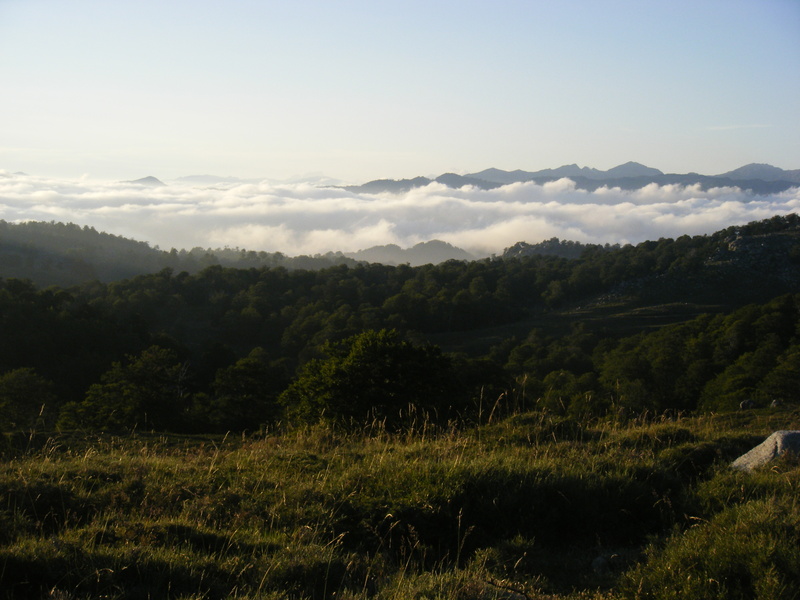 We set off on the trail at 7.15am heading through the woodland and contouring around the hillside gently ascending. 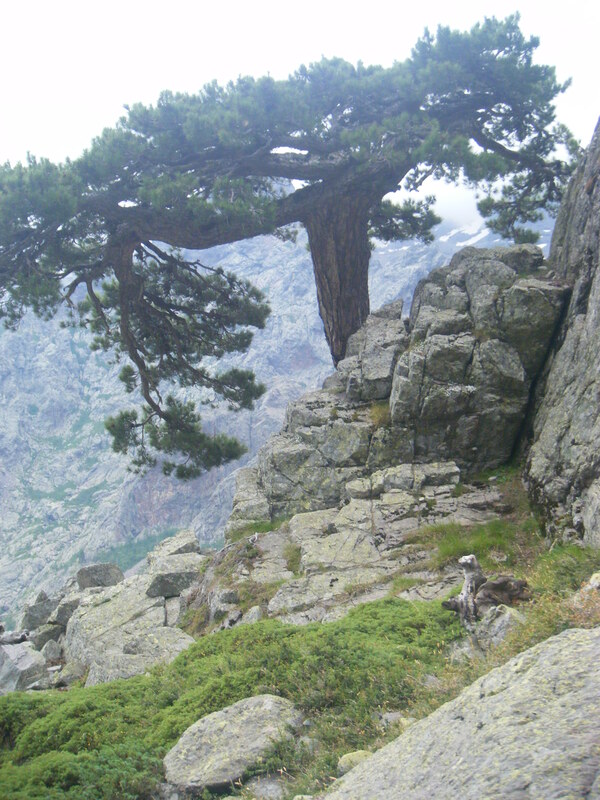 Eventually as we left the trees behind the path steepened to ascend to the high pass of Bocca di Foggaile, thankfully scrambling up rock was limited to near the top. At the top of the pass you can see the route onwards. 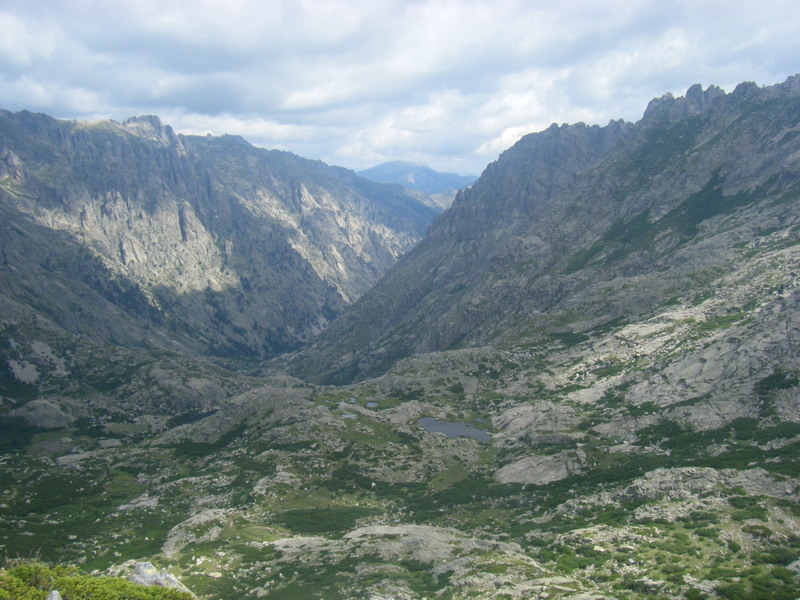 There is a short cut path now descending straight from the pass down to the river below but we stuck to the trail and contoured around the top of the Golo valley to Refuge de Ciottulu (the highest refuge on the GR20) for a well earned drink. 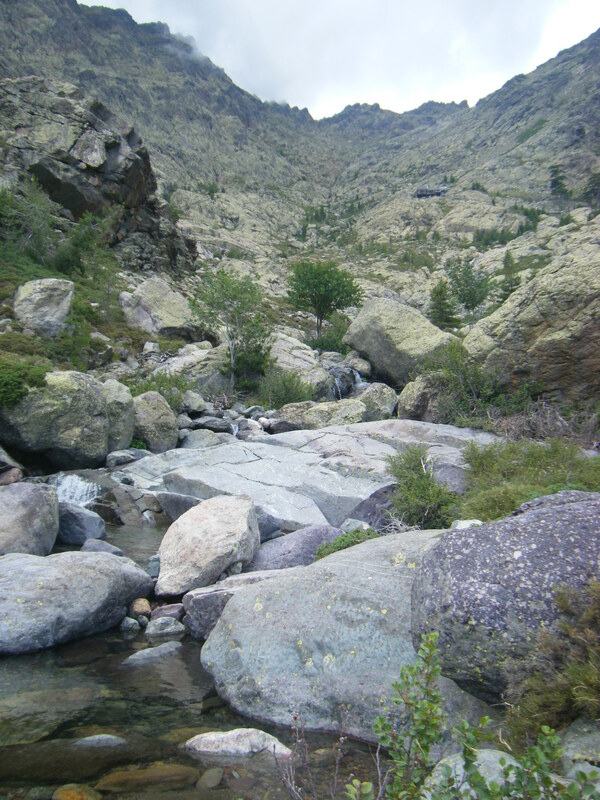 The route on from the Refuge down the Golo valley is pretty easy walking until it reaches the river, but in the scorching heat we couldn’t resist having lunch by the river and dipping our feet. From the river the path becomes rocky and hard on the knees until we eventually reached the woodland and crossed two bridges and reached the Bergeries de Radule where it would have been rude to not stop for another drink, so we stopped. 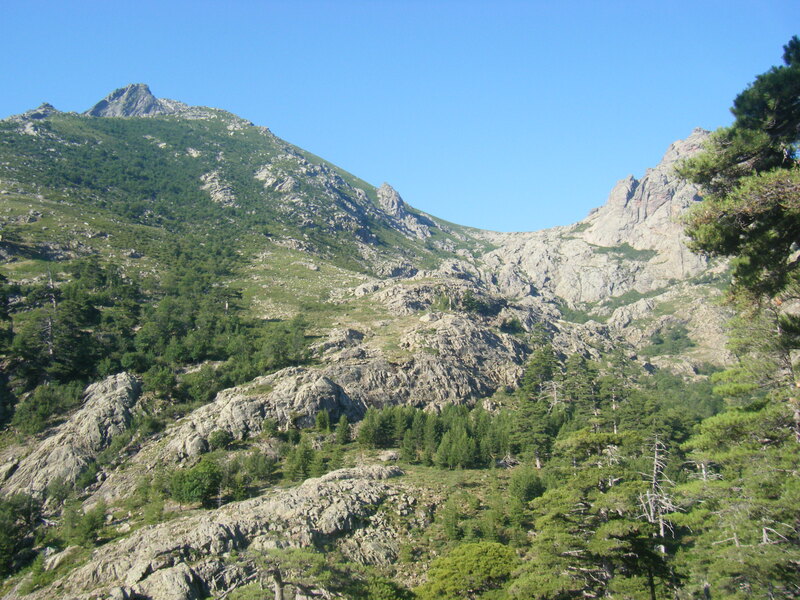 The path extended onwards through the woodland and the views become limited but there are plenty of opportunities to see the wild pigs common in Corsica. 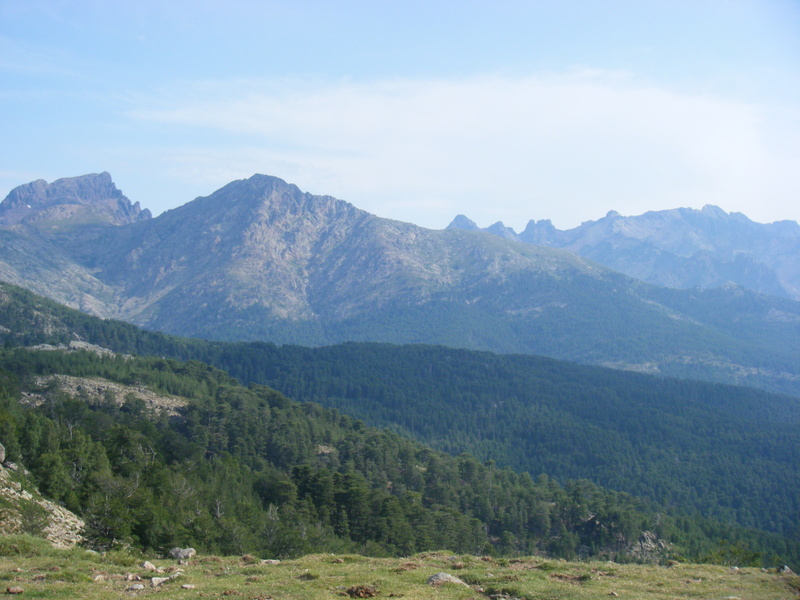 In the woodland the GR20 also crosses the Mare a Mare Nord route (sea to sea north). We were all very relieved to reach Castel di Vergio as it is a fantastic hotel with private balconies, white fluffy towels, great views and ice cream! It felt like a treat to lie in a real bed until 6.30am and have a breakfast that wasn’t rushed in 30 minutes. 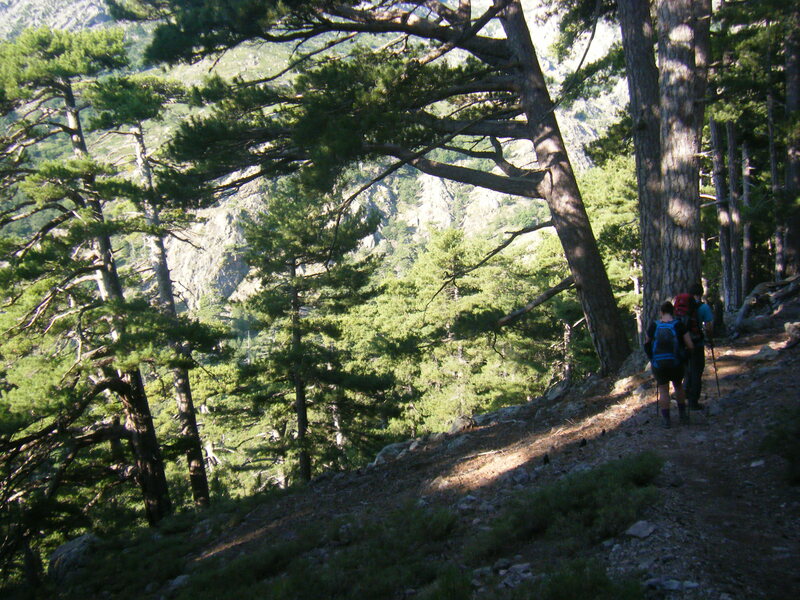 We left Vergio at 8am and headed at a fast pace through the woodland on a really easy track which was virtually flat. 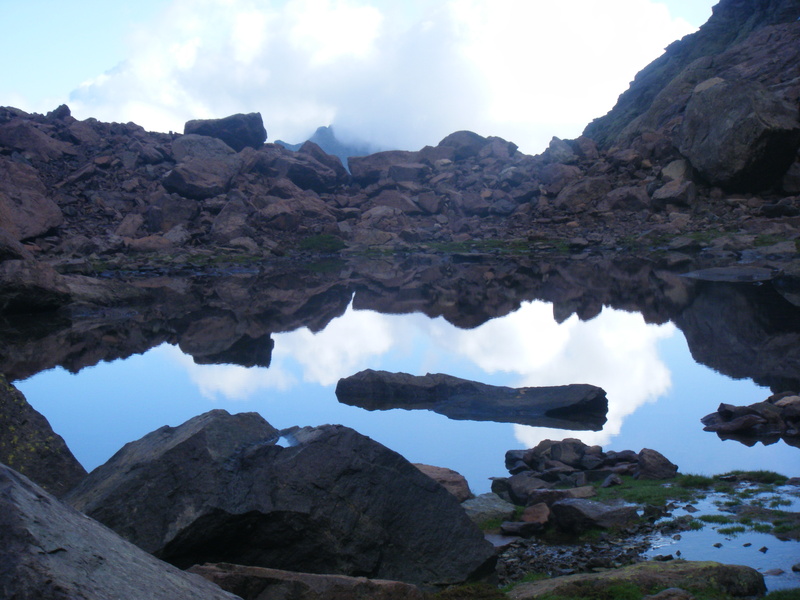 An odd walking sensation after days of scrambling over boulders. 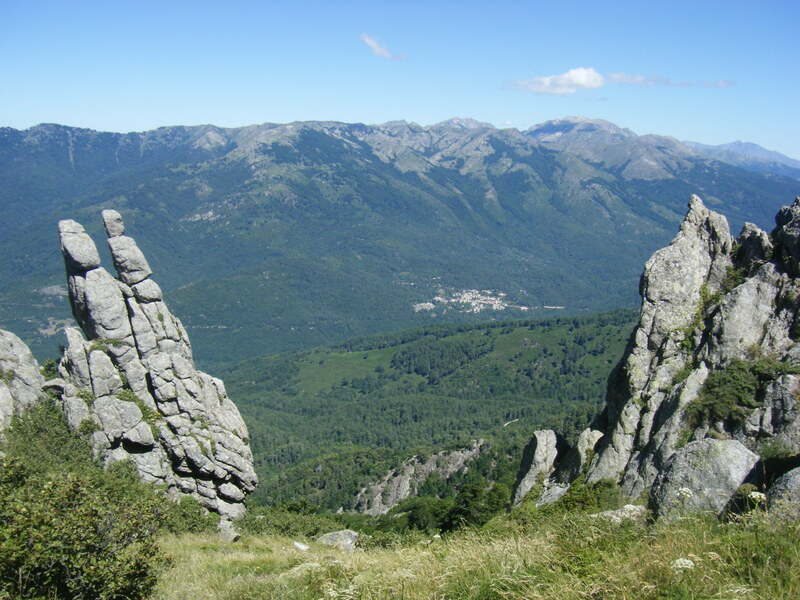 We reached the Bocca San Pedru in an hour and a half and had great views back to Vergio and the previous day’s walk. 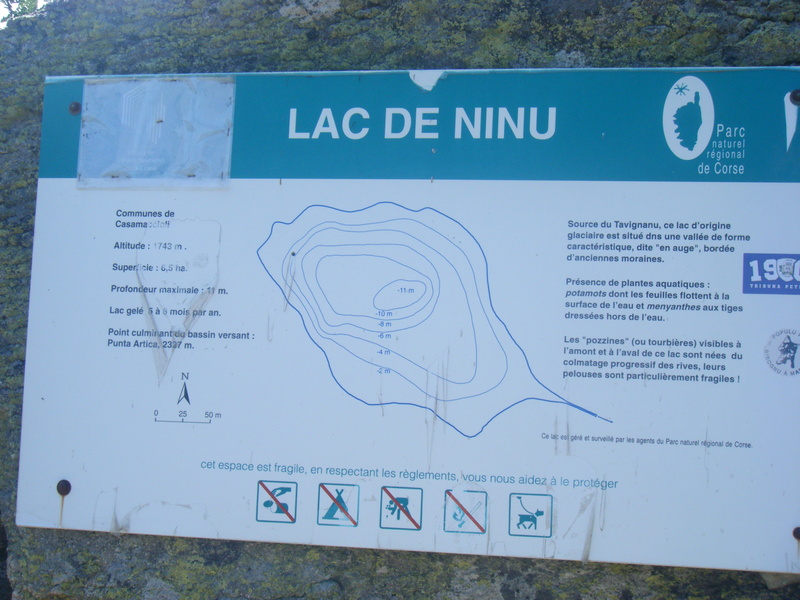 The path continues to be easy as it ascends and then descends gradually to the Lac du Ninu and a perfect spot for a very long lunch. As we sunbathed we could almost pretend we were on holiday! 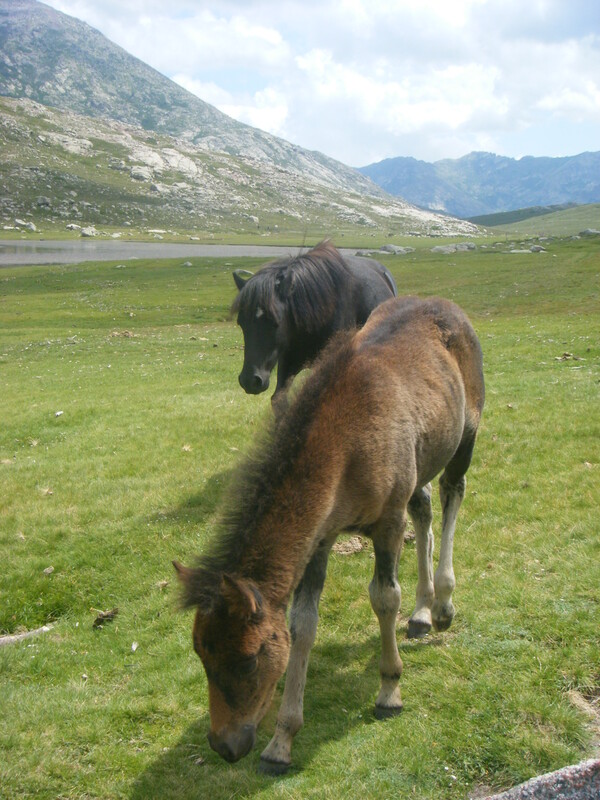 Especially with the visiting wild ponies. 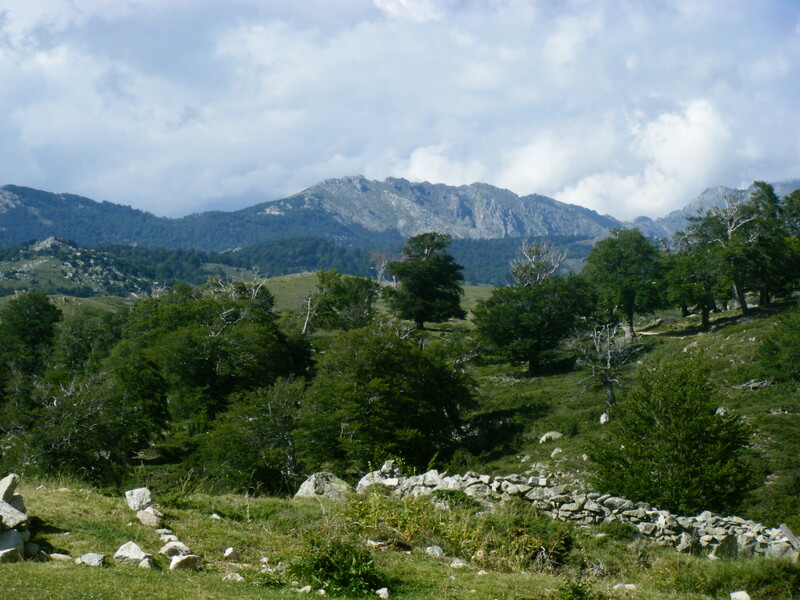 As we continued on, the path remains level through scrubland and woodland until it reaches the Bergerie de Vaccaghja where we stopped for a drink. From here we could see across the valley to Manganu, across the plateau. 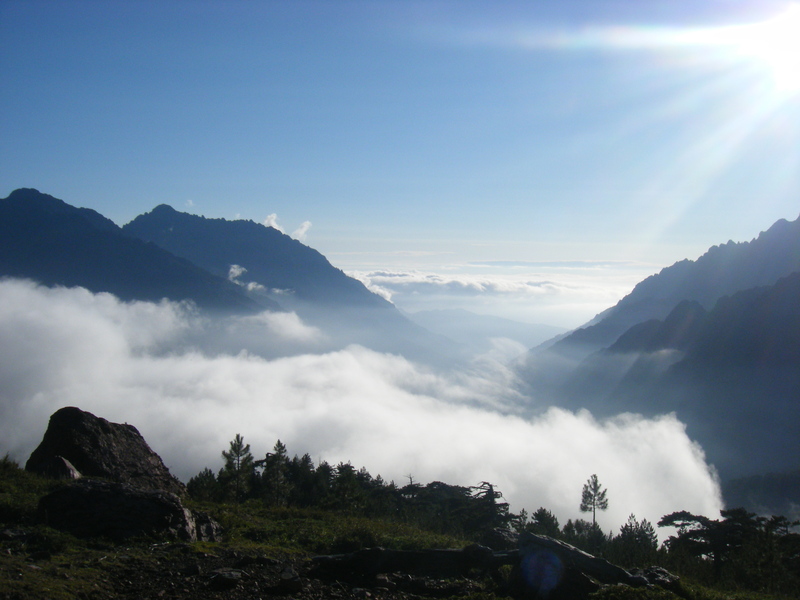 Whilst the route continues to be relatively flat across the valley there is a short ascent to reach the refuge at Manganu. There is dormitory accommodation here but we were staying in tents, which were much more roomy than those at Vallone, with super thick mattresses. Food here was plentiful but similar to the other refuges, this time pasta and soup. Whilst we had a girly moment having discovered an earwig under the mattresses which had been there a while, that was to be the least of our problems at the site in terms of wildlife. Here’s our visitor who we named Betty. 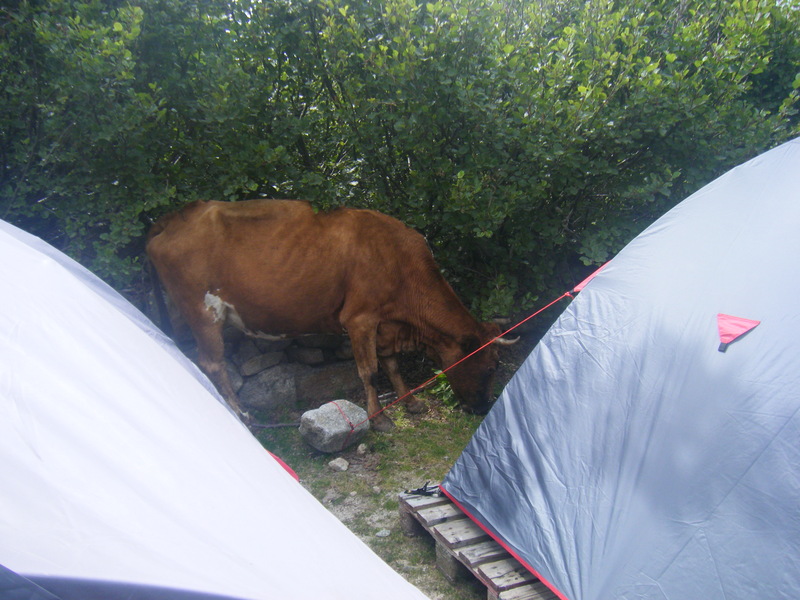 Despite our tents being tucked in the undergrowth this didn’t stop Betty coming to say hi. Thankfully as the sun set she moved on. 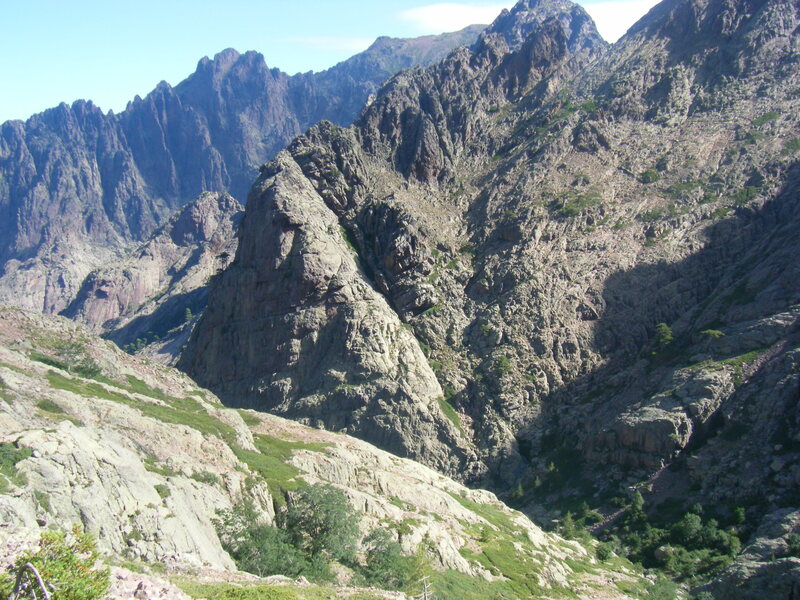 Everyone who’s made the effort to read about the GR20 before heading out to Corsica has heard of the infamous Cirque de Solitude, the most technical day on the route. 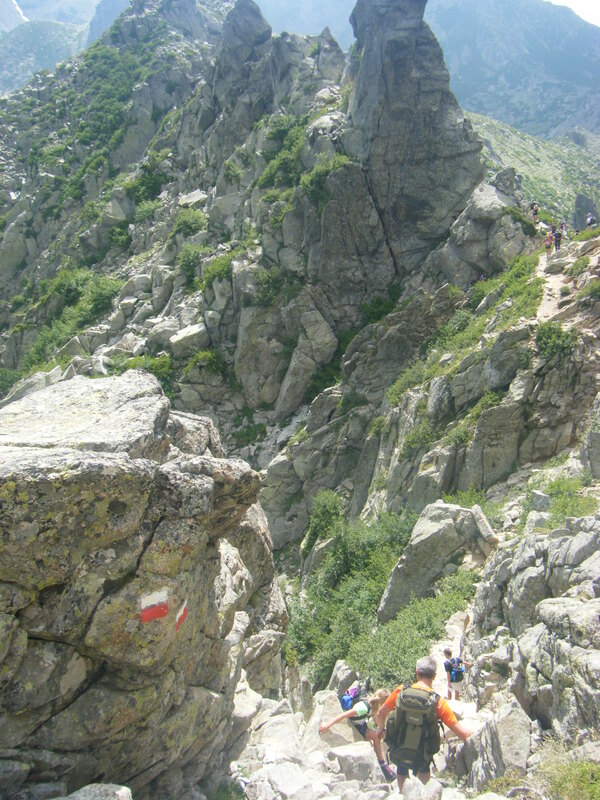 And while looking down into the bottom of the Cirque from the Col Perdu it certainly feels like you’re staring down a rocky cliff into an abyss, it is certainly achievable if you can hold your nerve. We left the lovely hotel as Asco filled with the first decent breakfast in days (and real coffee!) and headed up the track early. We set out at 6.30am to make the most of the day, and to ensure we were in and out of the Cirque before the predicted bad weather arrived. 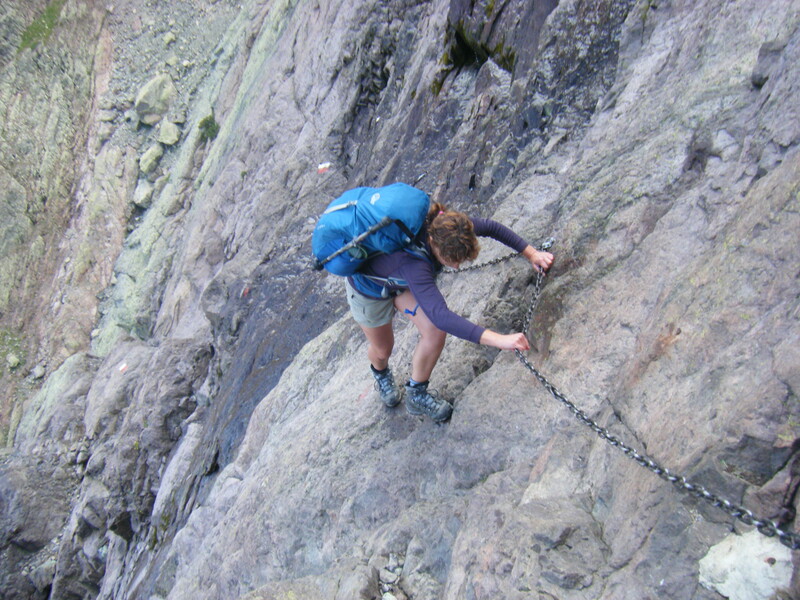 As the route through the Cirque is entirely rock slabs with chains to hold it is not to be attempted in wet or stormy weather. The path from Asco starts out as a woodland track which heads uphill until it finally becomes bouldery. 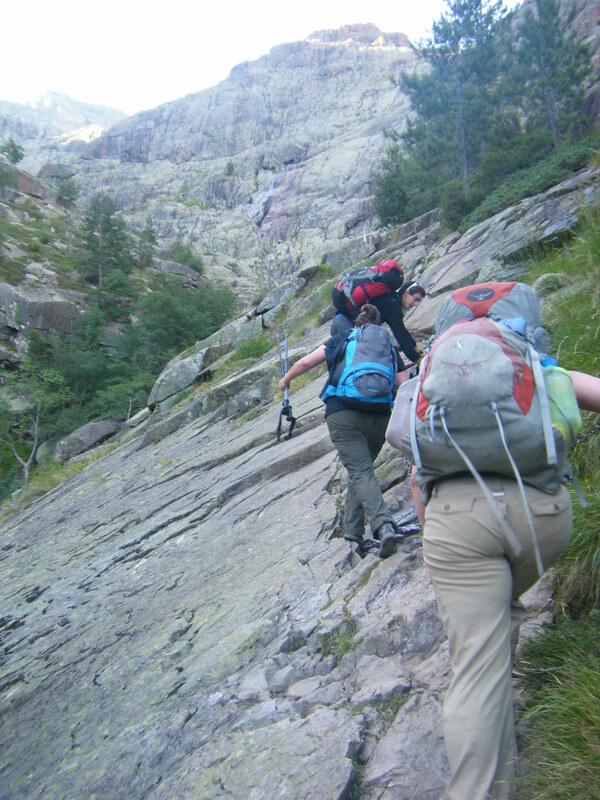 As we got closer to Col Perdu the path becomes more rock slabs and requires hands to ascend. 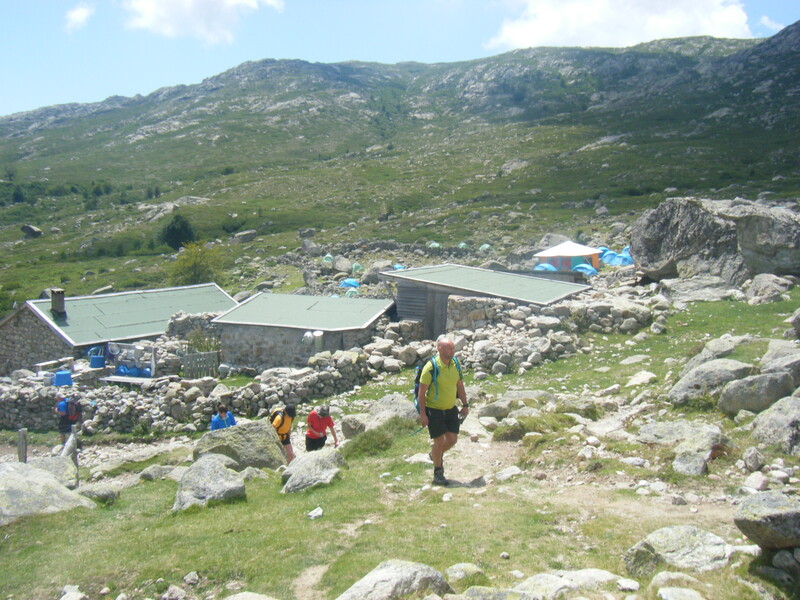 When we arrived at Col Perdu just before 10am, a lot of walkers were already en route and had stopped for a break. Spotting that many of these were from large groups our guide insisted we continued into the Cirque right away to get ahead of the bigger groups, which was certainly appreciated. 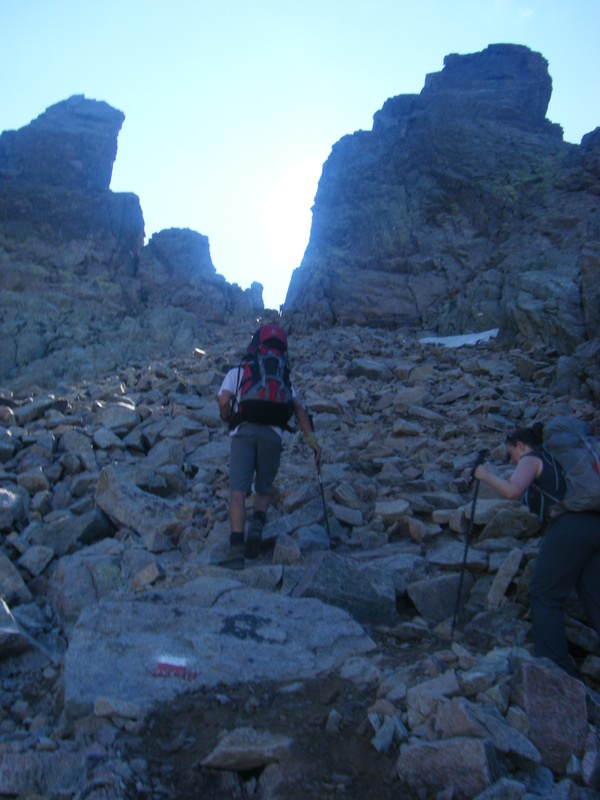 The descent into the Cirque de Solitude begins as a scree path and quickly becomes steep rock slabs with the flashes of paint marking the route and leading to the sections of chains. 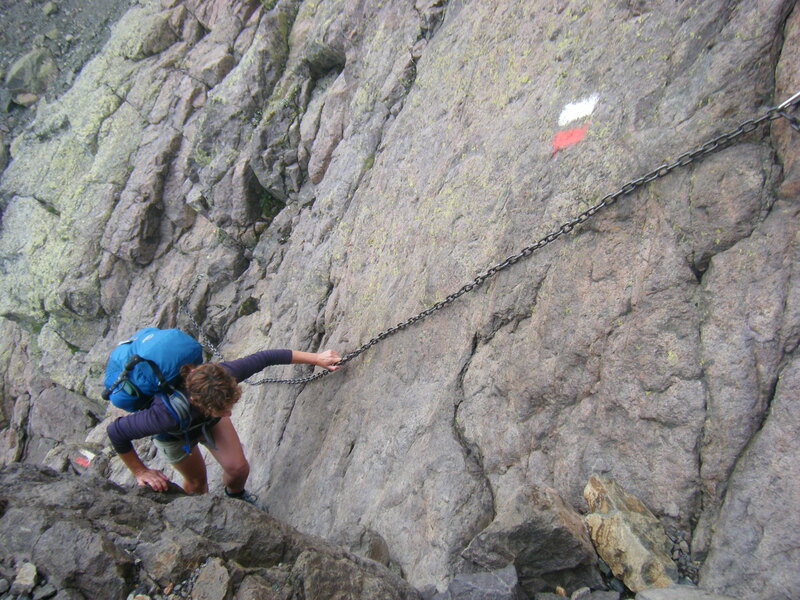 Without these chains the route would certainly require rock climbing skills and rope, but with the chains all you really need is a bit of bravery, good footwork, a tight grip and encouragement! 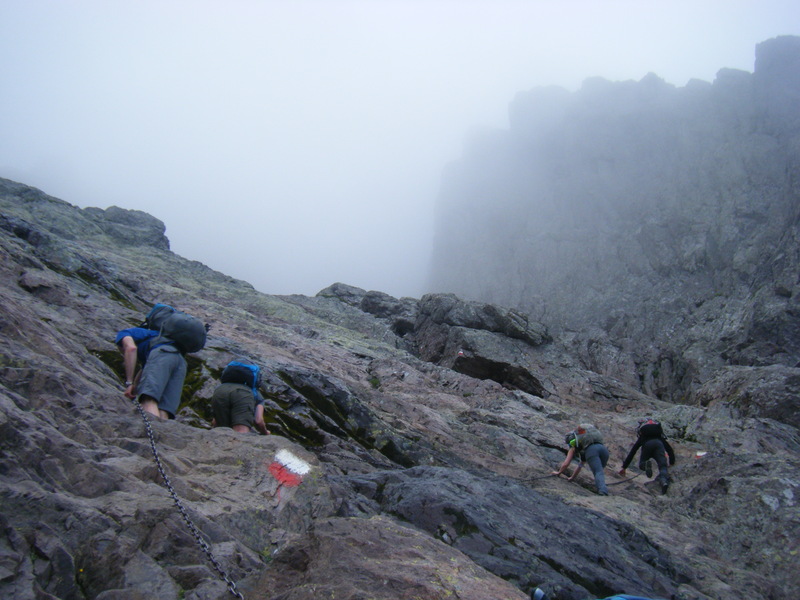 Being a small group we managed to descend the Cirque at a relatively good speed, though its hardly quick scrambling and abseiling down rocks and chains. looking back up to the bigger groups behind us. 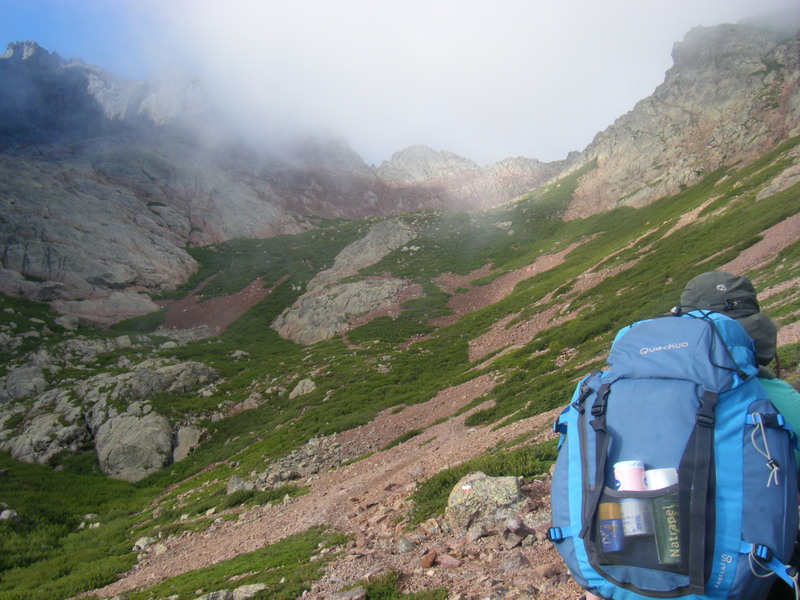 We had a short break at the bottom of the Cirque to collect nerves and have something to eat before we started the ascent back out. 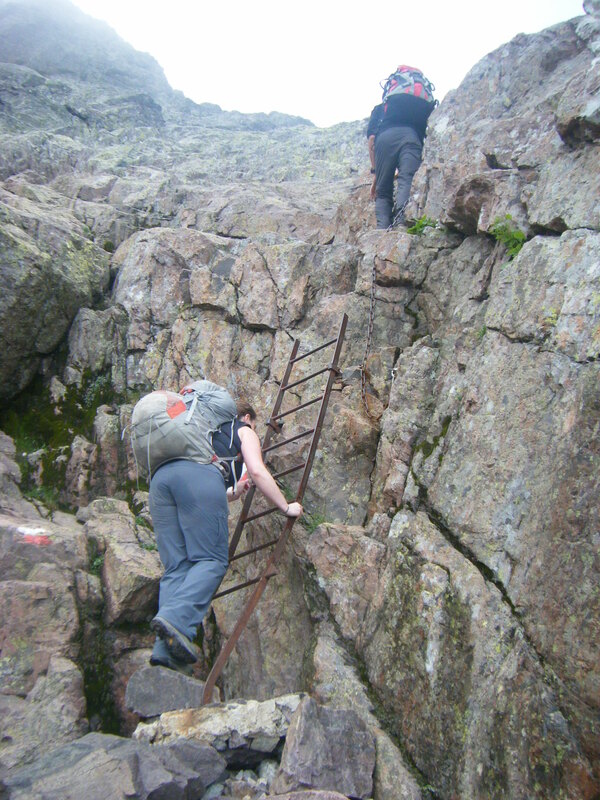 The ascent up the other side was very similar in terms of technicality although there was one short ladder to ascend. 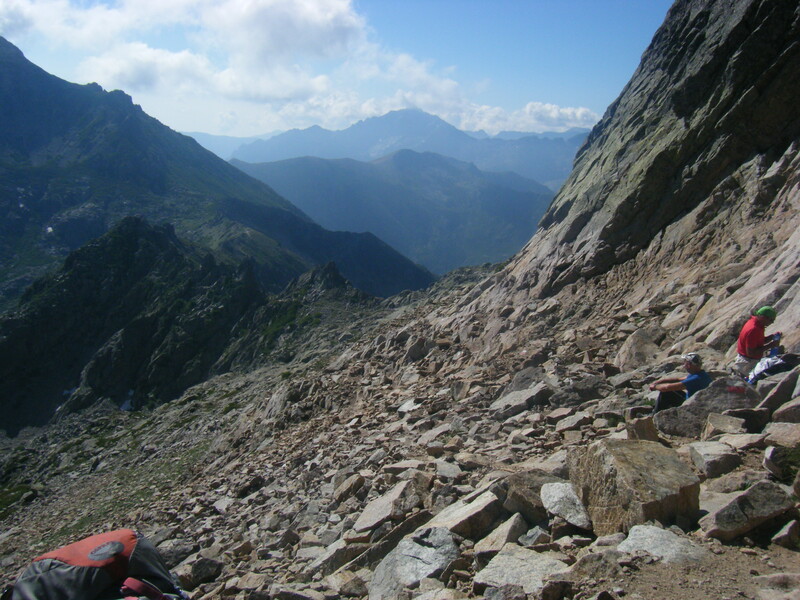 As the route gets closer to the top of the col it reverts back to bouldery rocks and scree before you appear at the Bocca Minuta where we stopped for a well earned rest. 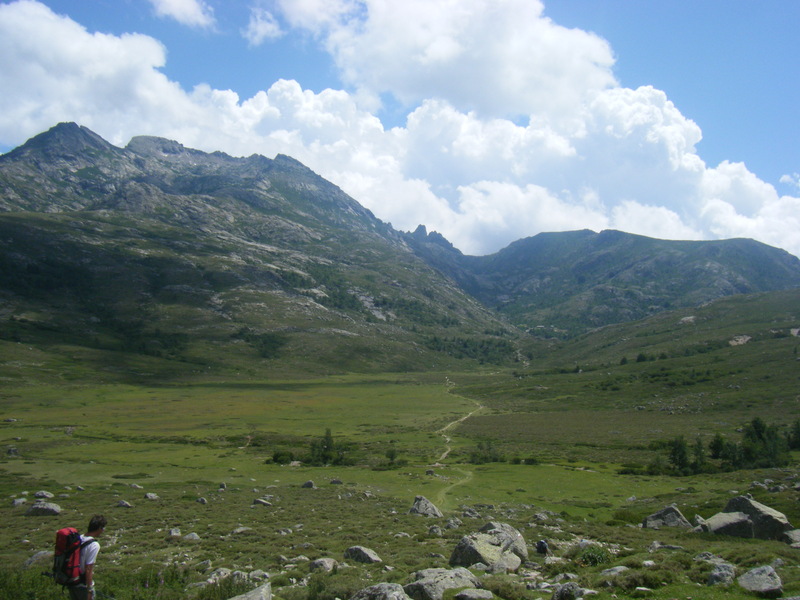 Getting from Col Perdu on one side of the Cirque to Bocca Minuta on the other took us about 3 hours. 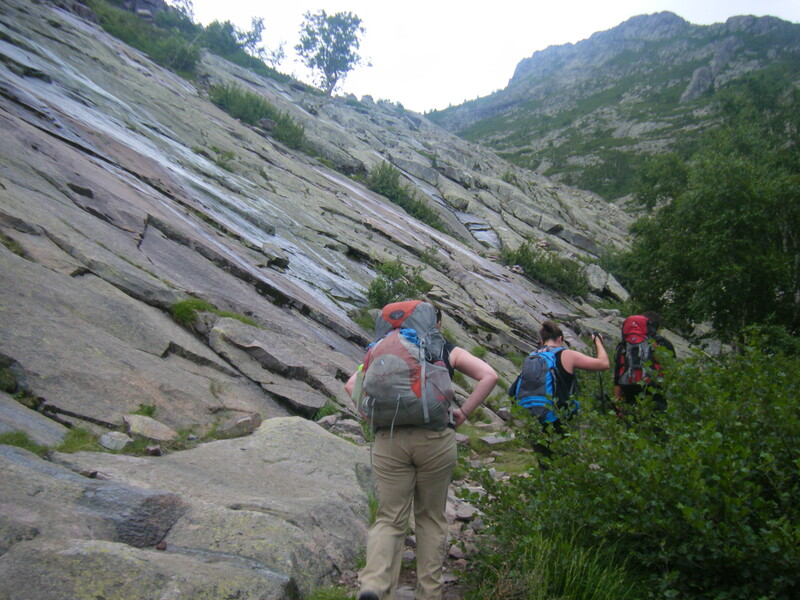 The descent down to Vallone is not exactly much quicker as it continues to be a rocky path of boulders and bare rock. 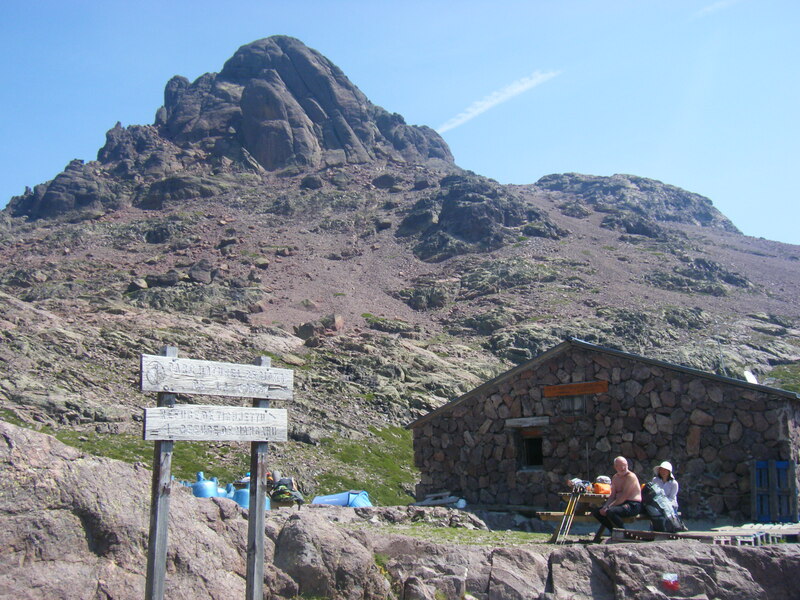 So when we reached the Refuge de Tighjettu we had to stop for a well earned hot chocolate. 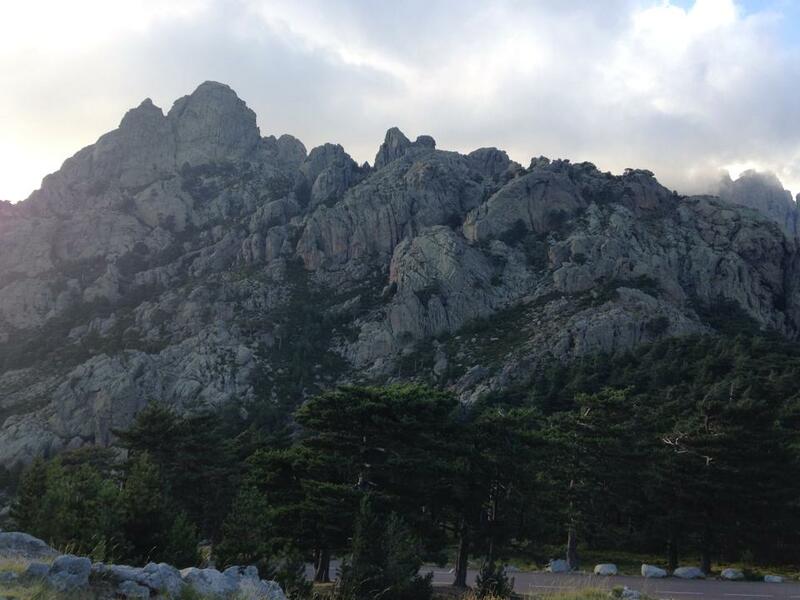 From here is was only another half hour to reach our refuge for the night at Auberge de Vallone. This was our first night in tents on the GR20. Tent accommodation along the GR20 is variable, tonight we were in pop up style tents which had clearly been up since the start of the season. The mattresses are foam and so were comfortable and aren’t left in the tent so they do get aired. 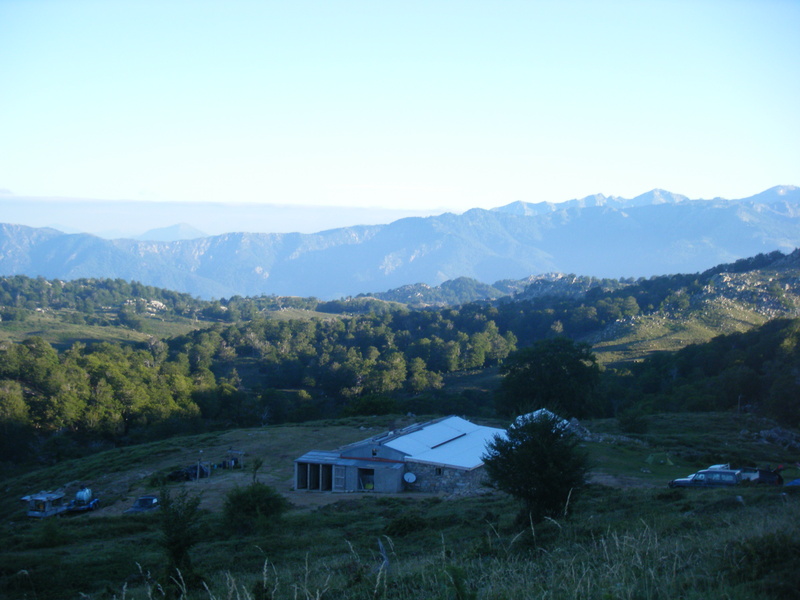 Toilet and washing facilities are limited with only one toilet and one shower to cater for everyone. So we were happy we were off to a hotel the following night. Heading South on the GR20 is the direction most people travel, and while you could go against the flow I preferred this direction for getting the difficult bits out of the way first. 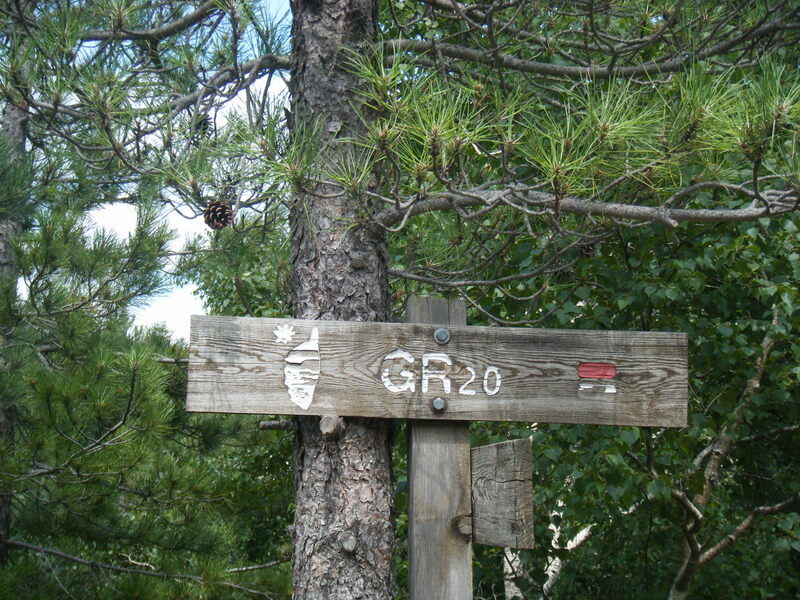 Or at least the most difficult, as there isn’t exactly anything easy about the GR20. 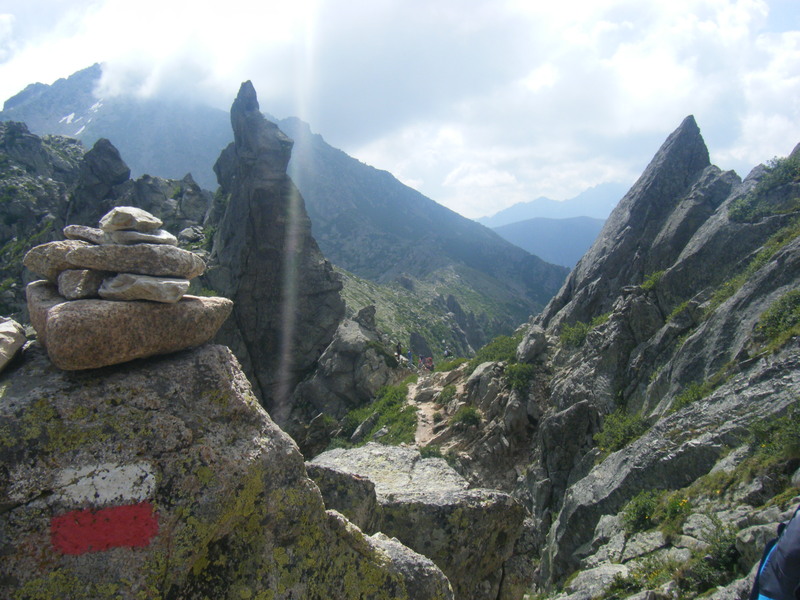 The first three days on the route are useful for testing skills in the group and for working out a suitable pace to be able to ascend 1000m+ each day and not end up out of breath. 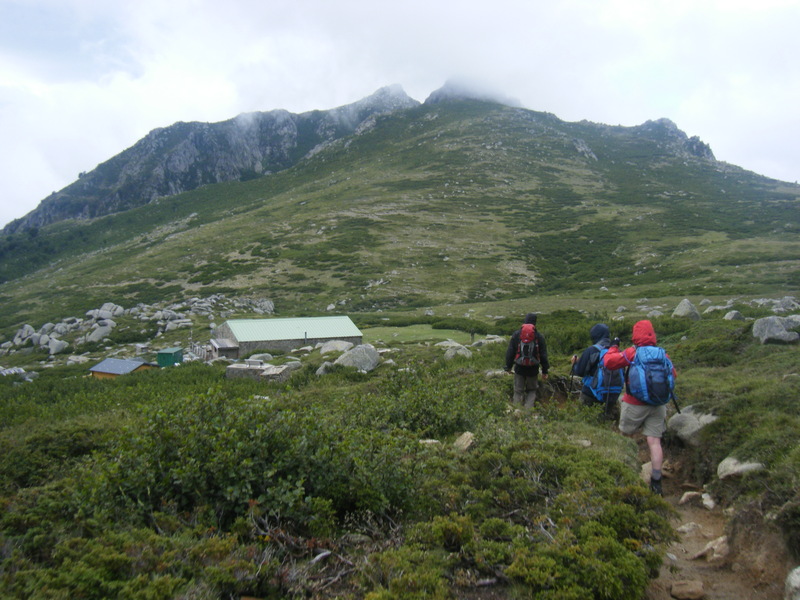 We had to carry over night kit (sleeping bags etc) on these days as the two refuges do not have road access. We left Calenzana at 9am collecting fresh bread from the bakery en route out of the village. 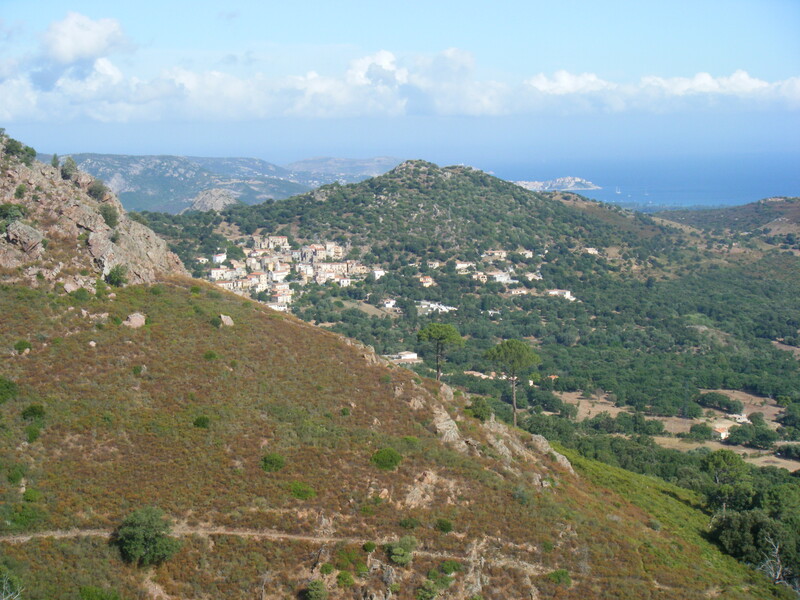 The route starts to climb almost immediately as we left and zig zags through woodland with great views out to Calvi and the coast to distract us as we walked. 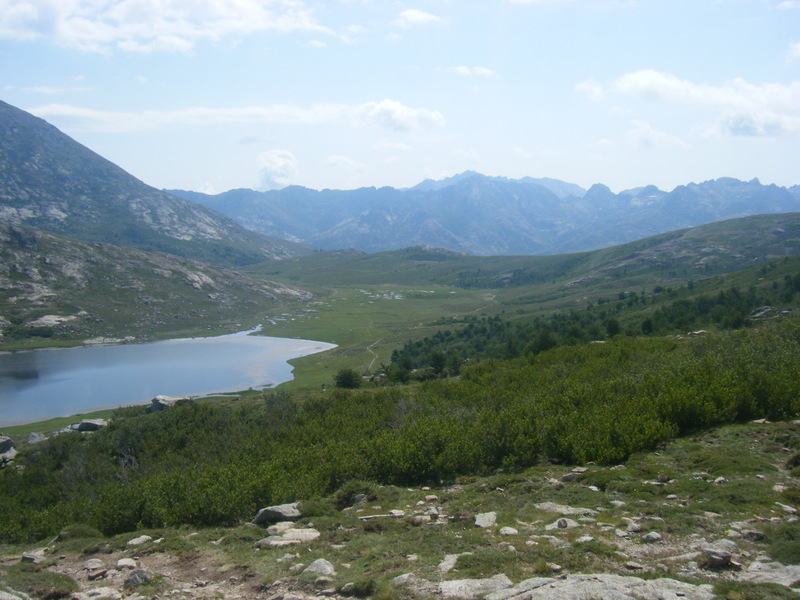 We stopped in the woodland for lunch and then continued up, crossing the col at Bocca a u Saltu. 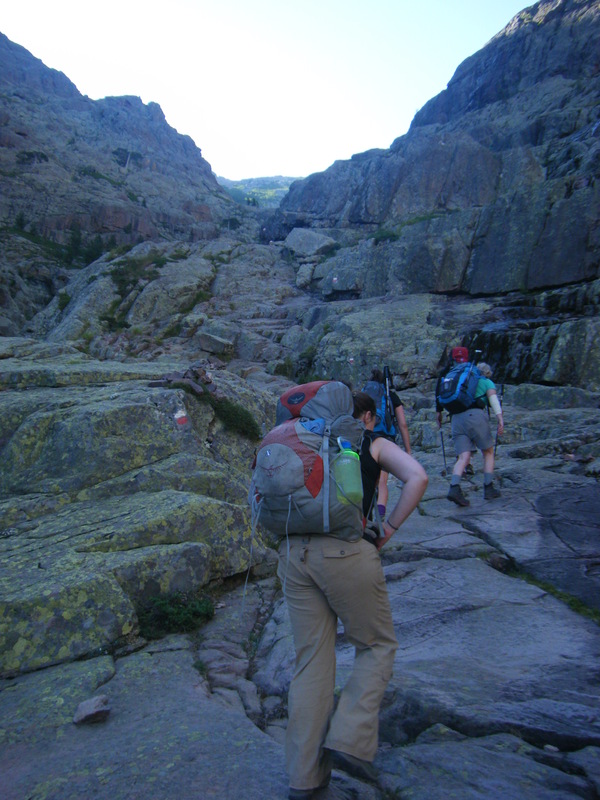 From here the path becomes more rocky and requires a bit of scrambling – it seemed a bit daunting to the novices in the group but considering what was to come, this was only a simple test. 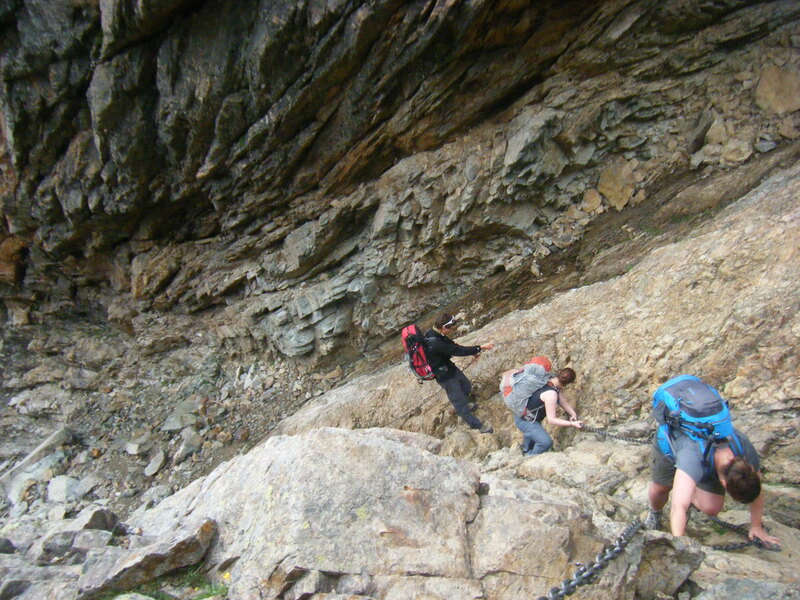 There is no exposure though on this scrambling so its relatively easy going. 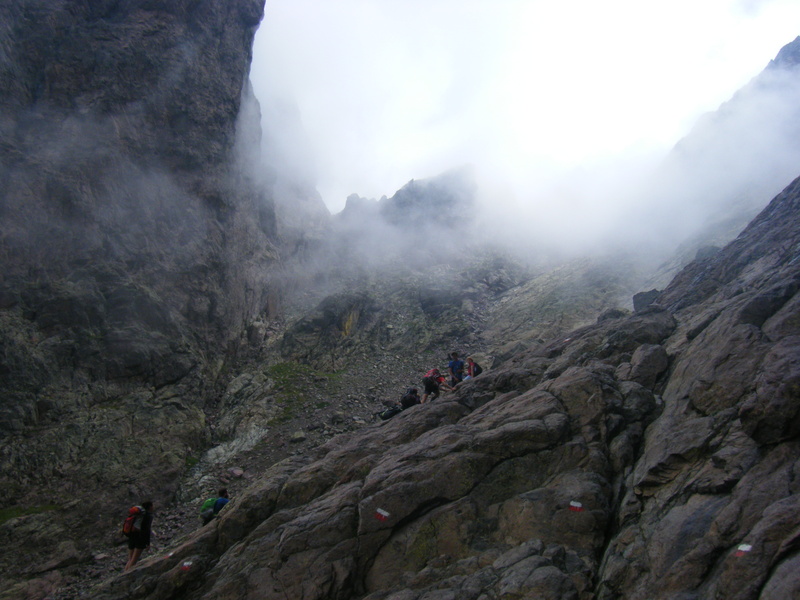 As the path crossed a small gully the first chain of the GR20 is here to aid a down climb of a small rock. 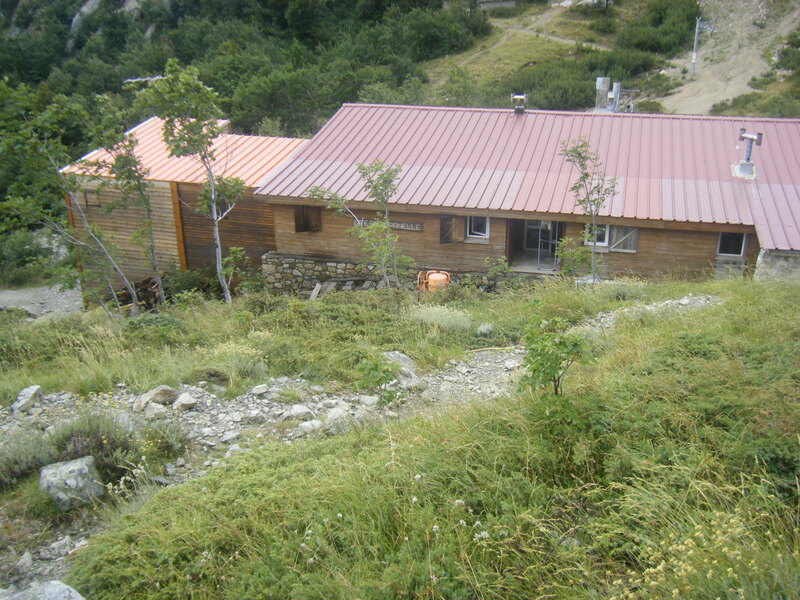 There’s not much downhill to reach to the refuge d’Ortu di u Piobbu, our first stop on the route. We arrived at 3.15pm having spent quite a bit of time having lunch and breaks throughout the day. Quite a few tents were already pitched when we arrived but having gone with a guide we already had bunks in the dormitory booked. 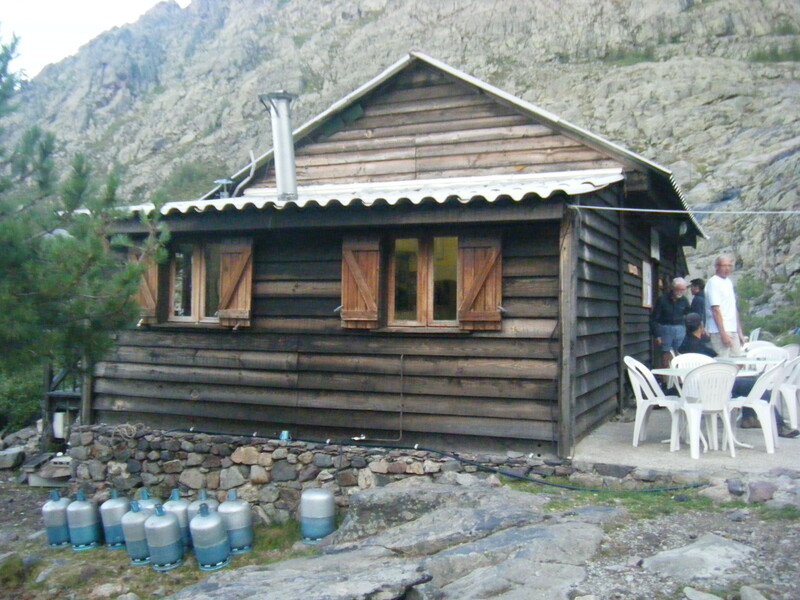 The refuge is basic but clean and as with all refuges on the route, had thick mattresses. 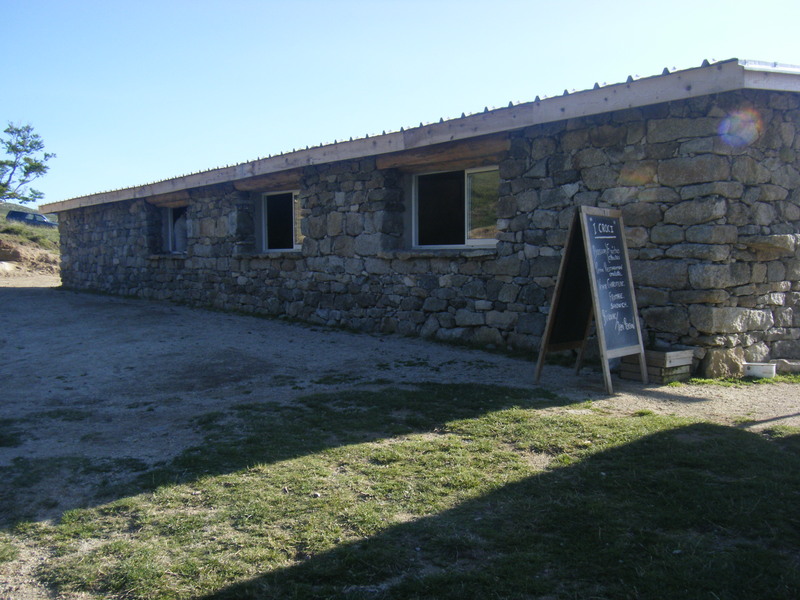 The only downside to the refuge is the long walk to the toilet from the dormitory, but the food was good and the bed comfy. I’d packed a 3 season sleeping bag thinking it would get cold at night. Sleeping in the dorm this wasn’t the case at all and halfway through the night I found myself grateful for having carrier a thin liner with me too. 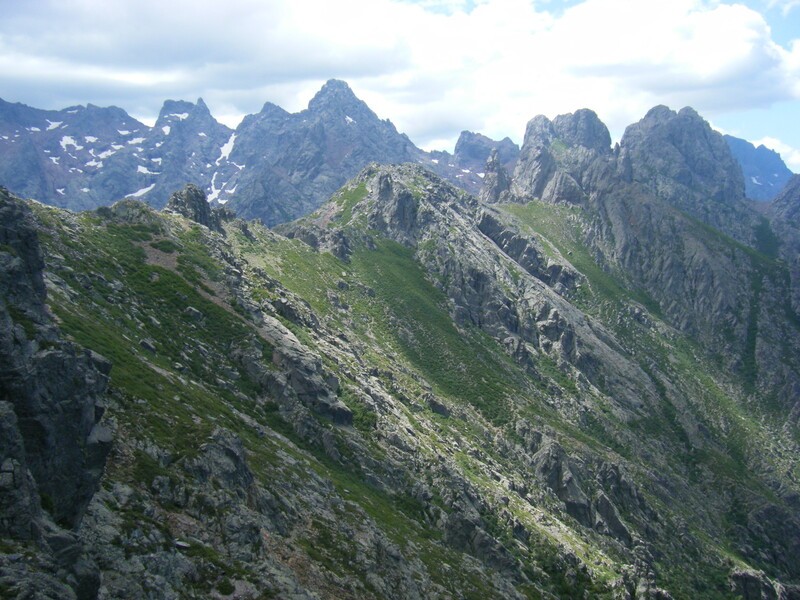 We took the high level route to Carrozu from the refuge. Having started walking at 7.30am after a breakfast of stale bread and jam (get used to it!) we weren’t exactly set up for the days walk. 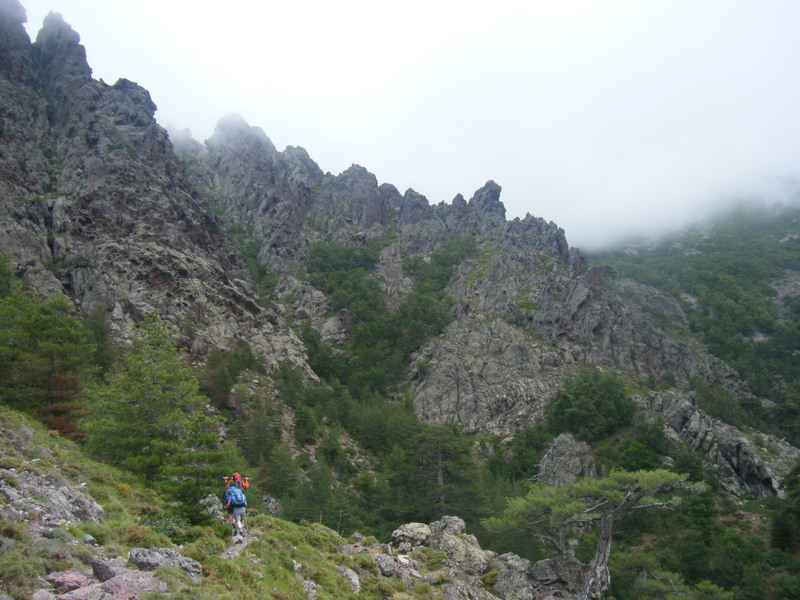 The route heads through the woodland before contouring around the hillside to the Cirque de Bonifatu. Already the walking had turned into picking our way through rocks and scrambling upwards, but thankfully there wasn’t a great deal of ascent today. 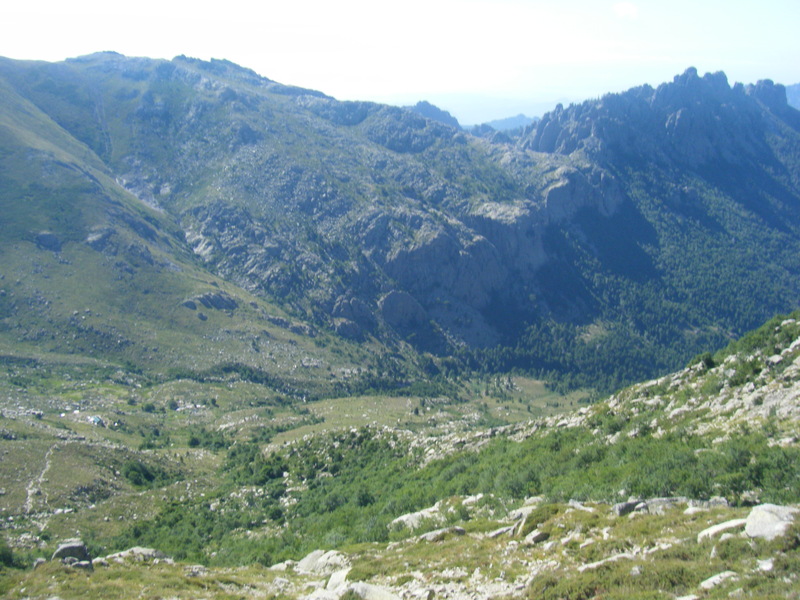 The view across the valley was amazing as we contoured around the Cirque. 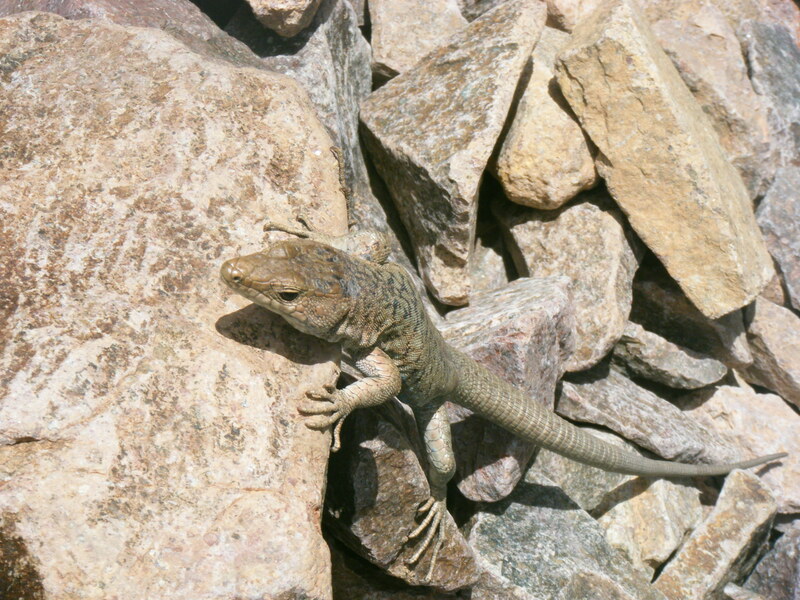 In the summer you will see lots of lizards around who scavenge for crumbs. There’s a few awkward steps to do here but nothing too challenging, but it does slow you down. 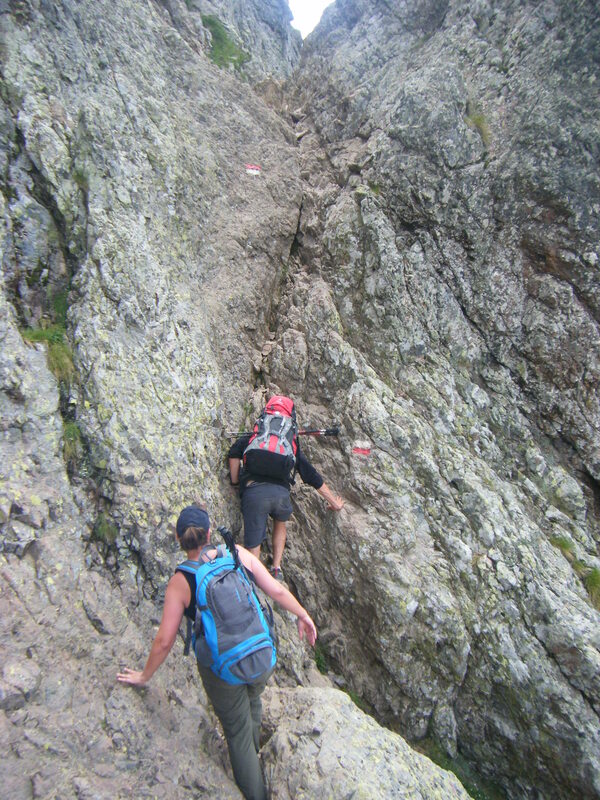 The descent down to the refuge at Carrozu is a steep scree path which is rocky and bouldery and is a good initiation into the descents to follow on the GR20. 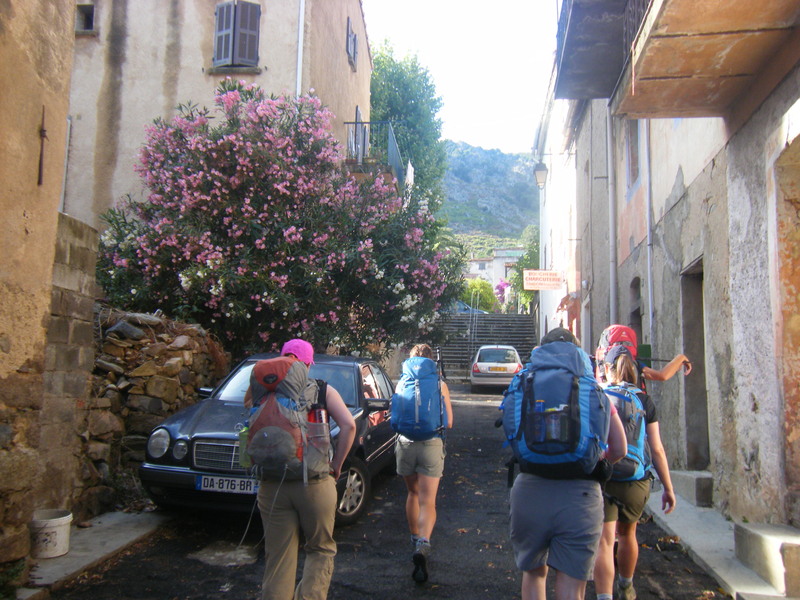 We awoke early and set off walking at 7.30am, which was a blessing as the sun was scorching hot very early in the day. Straight out of the refuge we headed through the woodland, scrambling over rocks and using chains to head around to the river and crossing the suspension bridge. 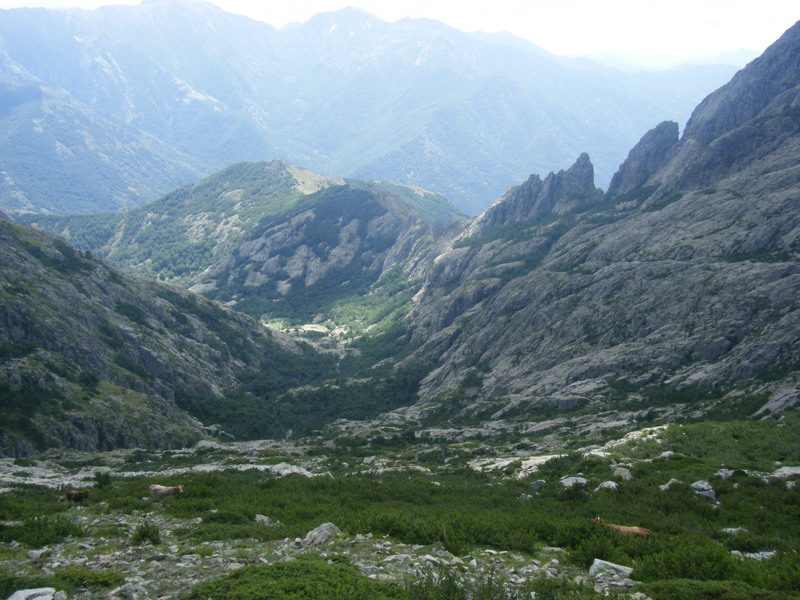 Once over the other side we continued to use chains to ascend the valley up the Spasimata gorge, a really spectacular valley. The chains seemed a little unnecessary in places but the slabs are huge and in wet weather I can imagine are treacherous. 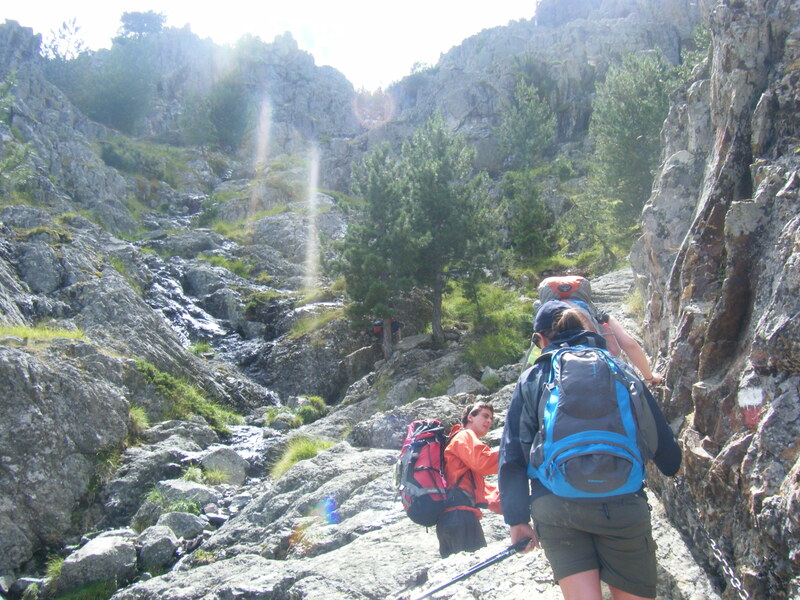 The ascent became slower as we reached the top – out of the shade and into the hot sunshine and had started to have to pick our way over the rocks. 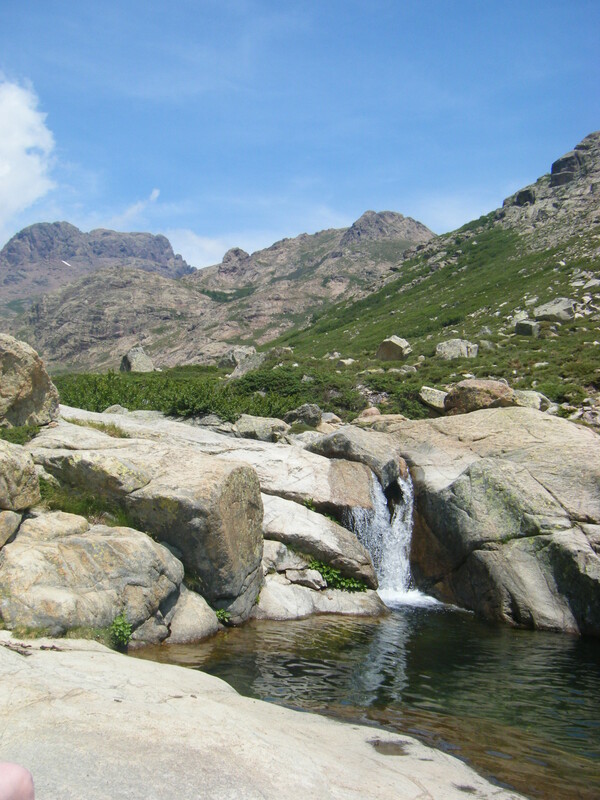 So it was a welcome relief when we reached Lac de la Muvrella for a lunch stop and to dip our feet. 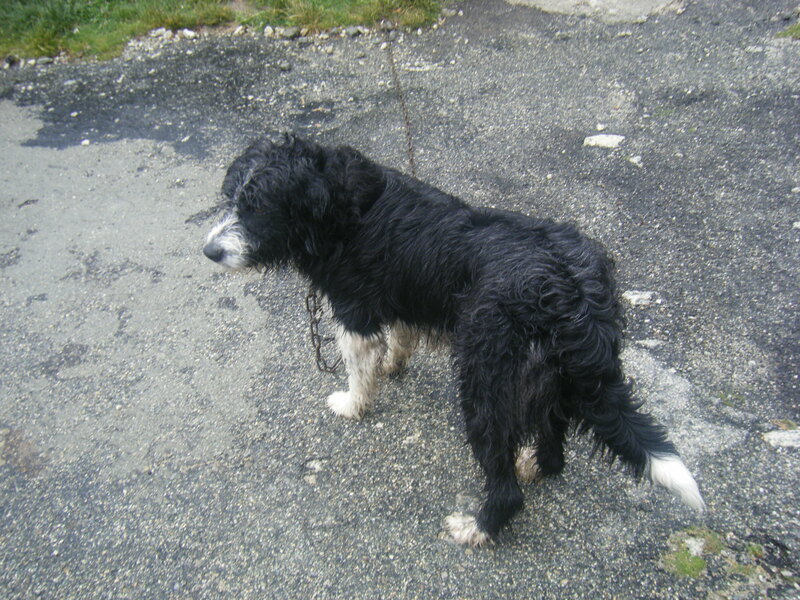 Asco felt like a treat after 2 nights in refuges as we had twin rooms with hot showers and an indoor loo! As well as great food and an opportunity to wash clothes. 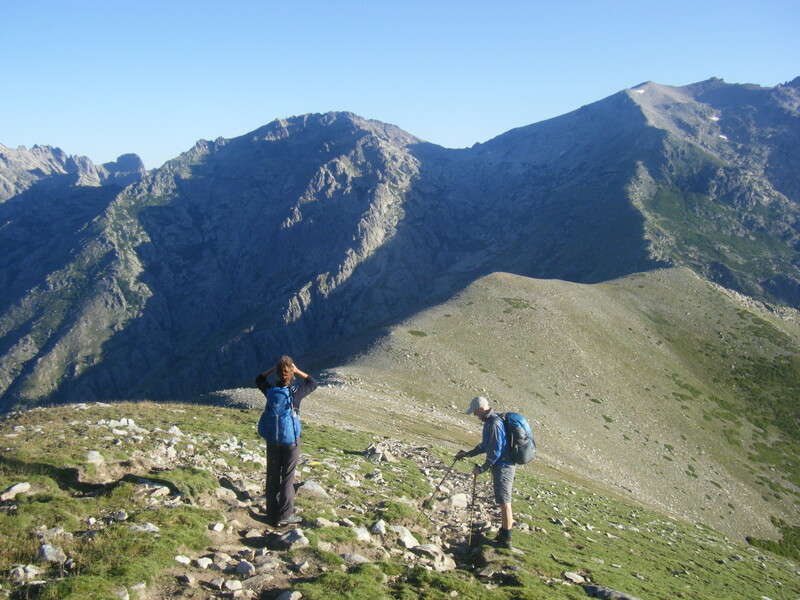 Discussions then turned to the day ahead of us and tackling the infamous Cirque de Solitude. 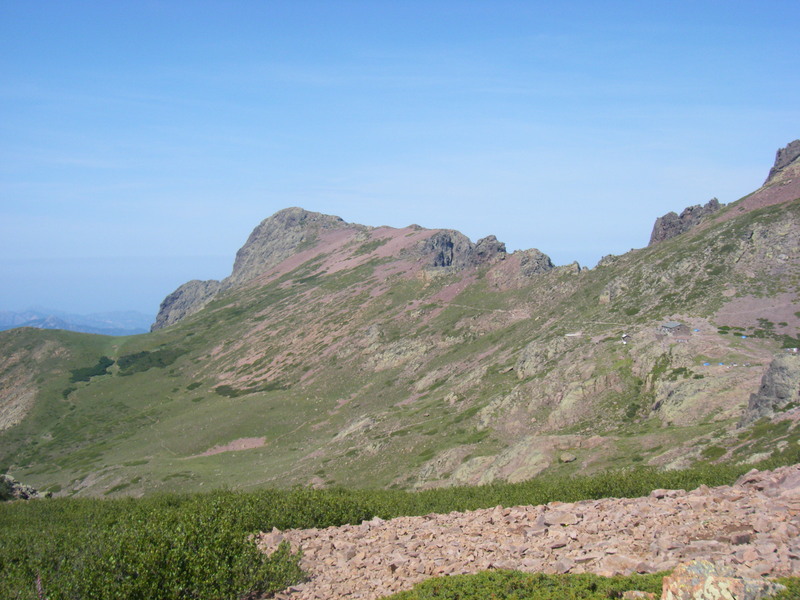 I’m going to publish my pictures and tales of the GR20 in a few different posts, as there is so much so say about this trail and so many pictures! 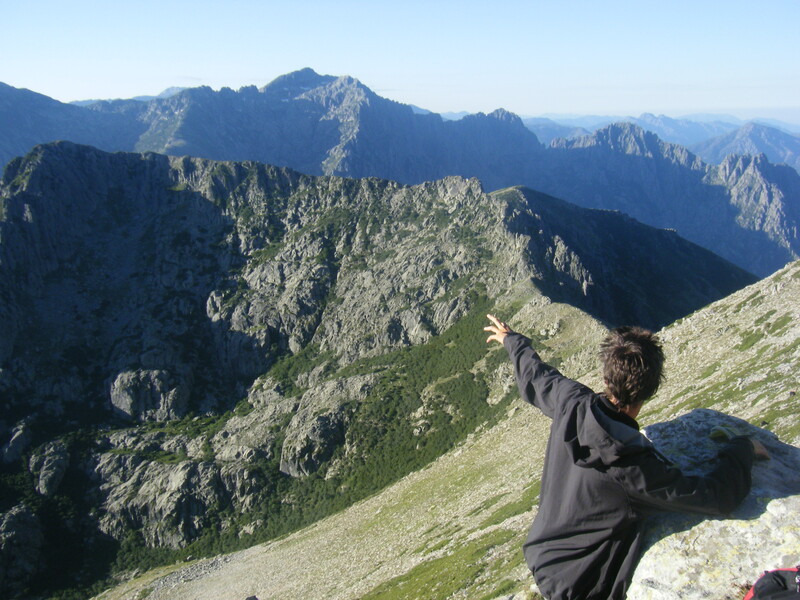 But I should start with the some of the facts you should be aware of if you’re going to undertake this trek. 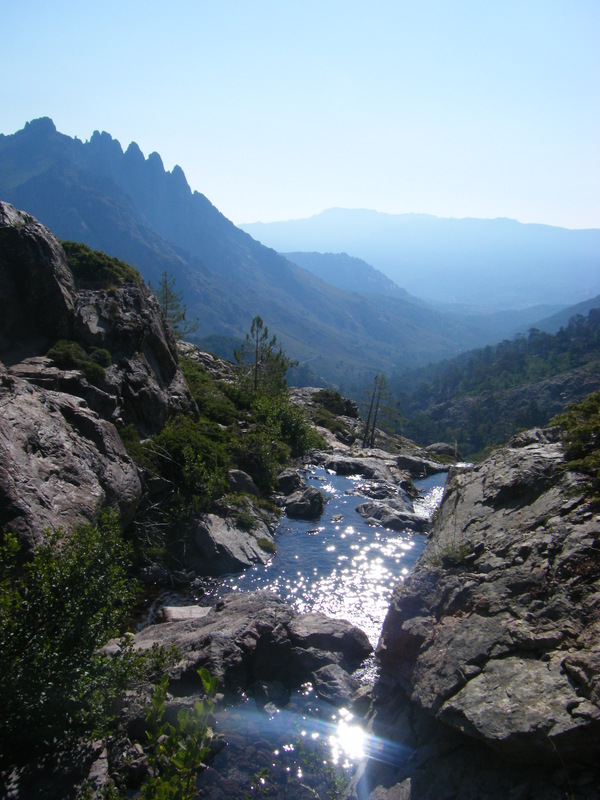 Also this website is fantastic for general facts of the route – Corsica for hikers. 1. 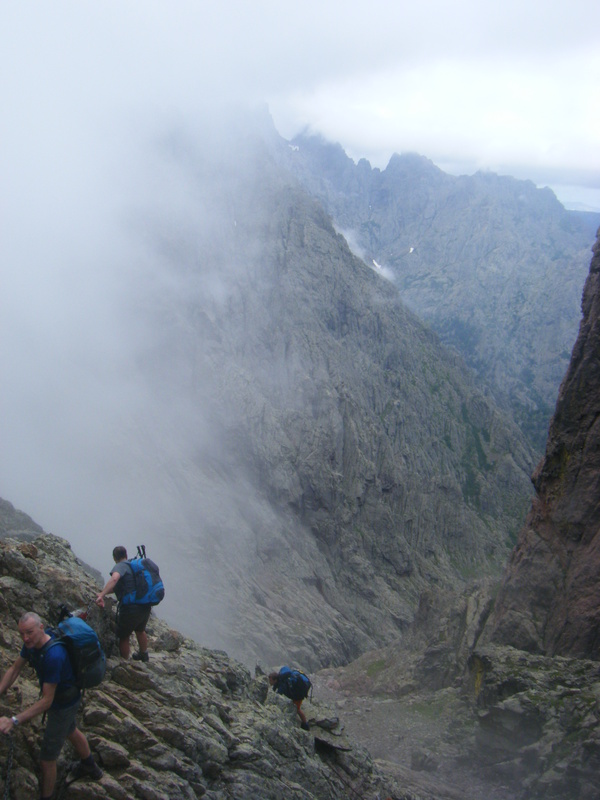 Be under no illusions, this really is the hardest walking trek in Europe. 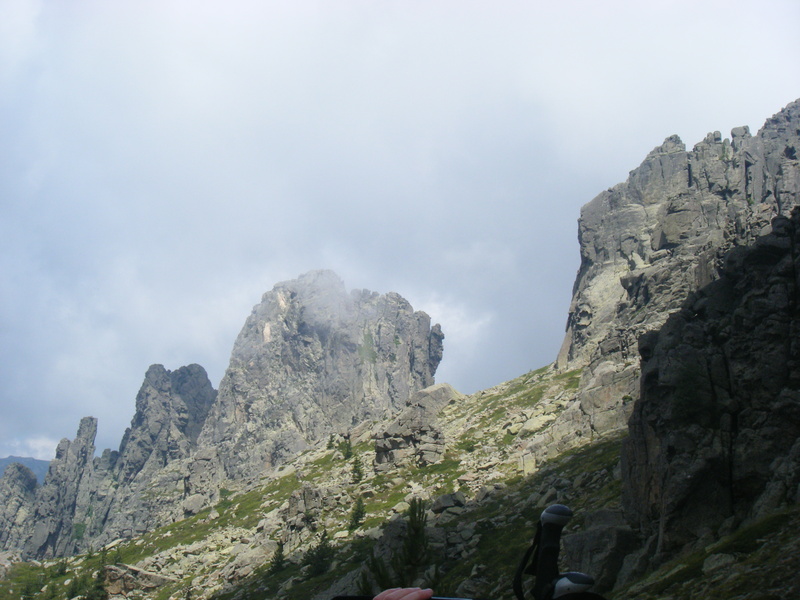 I have done a lot of walking and scrambling and even I found sustaining scrambling and the required ascent and descent needed to be a challenge, doing it every day for 13 days for at least 7 hours a day. 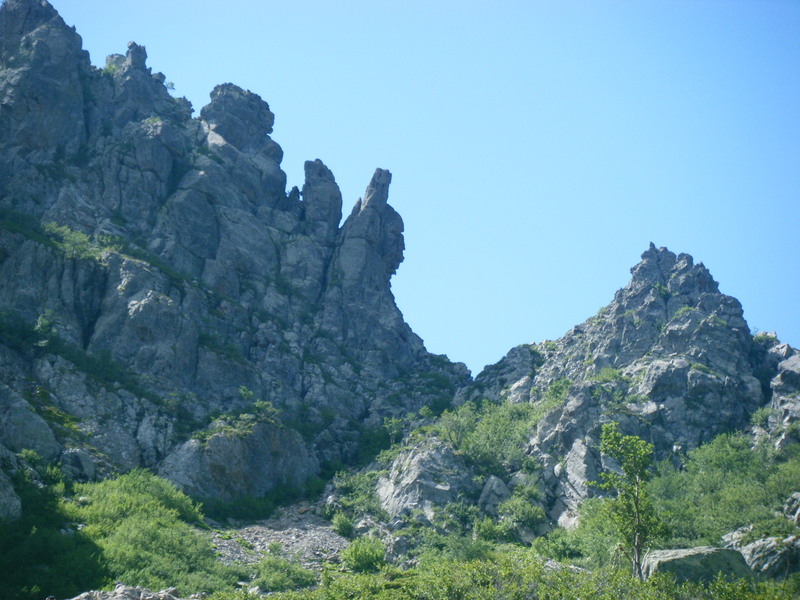 Some of the days, especially the infamous Cirque de Solitude have chains and require a head for heights (without the chains you would be in rock climbing territory). 2. Take walking poles. Europeans will have no issue with this, but Brits tend to think they are a sign of weakness – trust me your knees will thank you! 3. 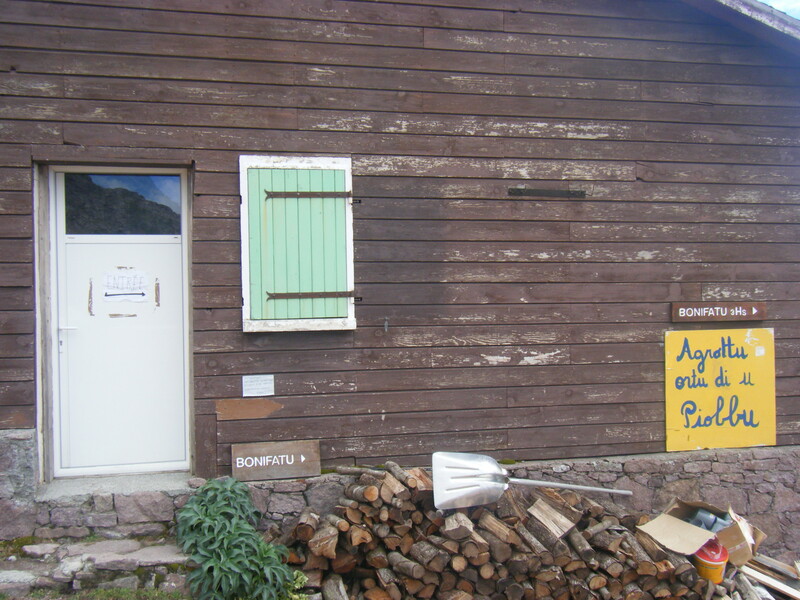 Accommodation and food along the way is basic – if you’re luck enough to stay in refuges along the way they are of variable quality, and below the typical standard in the Alps. 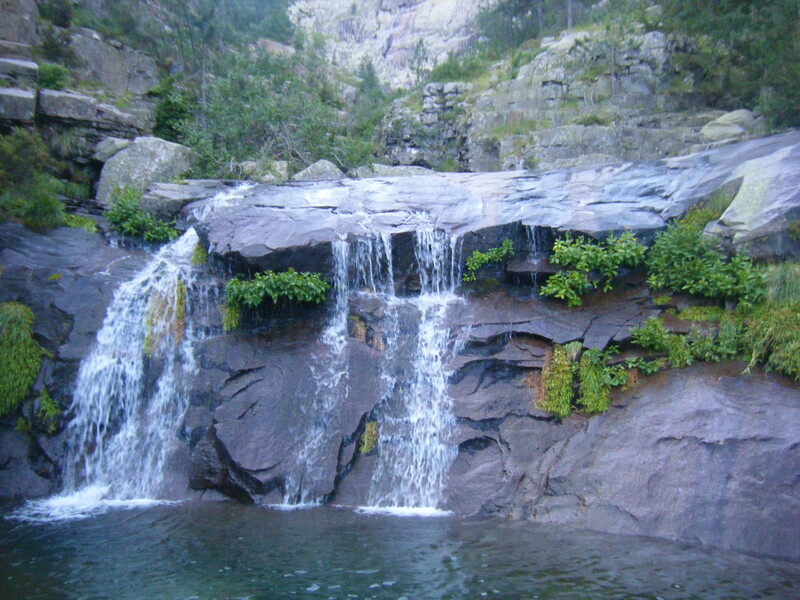 But they are remote, have fantastic views and this is a once in a lifetime experience. Refuges fill up quickly, (meaning that early starts every day are essential) so you could find yourself in a tent – these are variable quality too. I will post about each place I stayed as I go along. If you’re super lucky and have the odd day in hotels along the route, make the most of the hot showers and soft beds! 4. Be prepared for all weather possibilities. I travelled in July and expected to be scorching hot whilst walking. This was certainly the case on most days, but we had one day of torrential rain and another of cold wind and fog, so be prepared. I didn’t find July to be too crowded as suggested by some websites. 5. Be fit. Obvious really if you’re going to do a long distance trek. 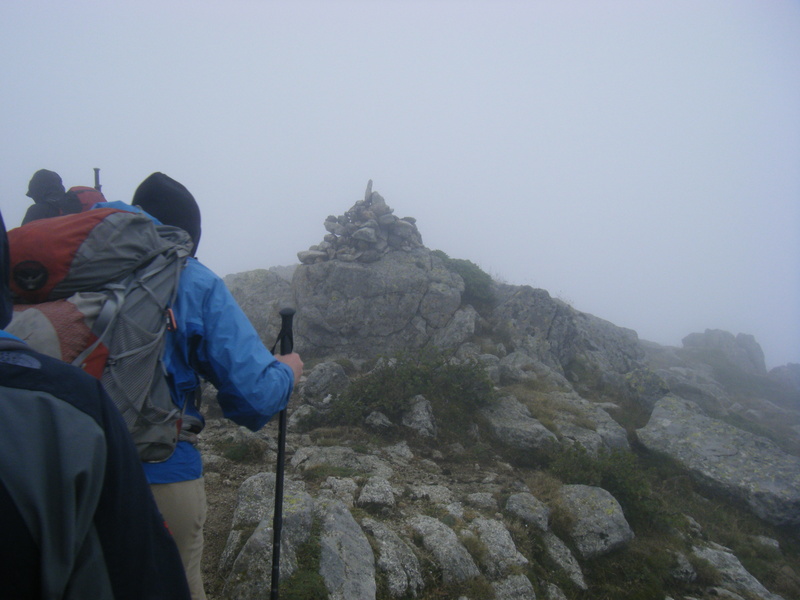 But each day has on average 1000m of ascent and descent and while the walking is shorter in length in the north the complexity of the terrain is more severe, and in the south the terrain isn’t much easier but the distances are greater. 6. Consider a guide. 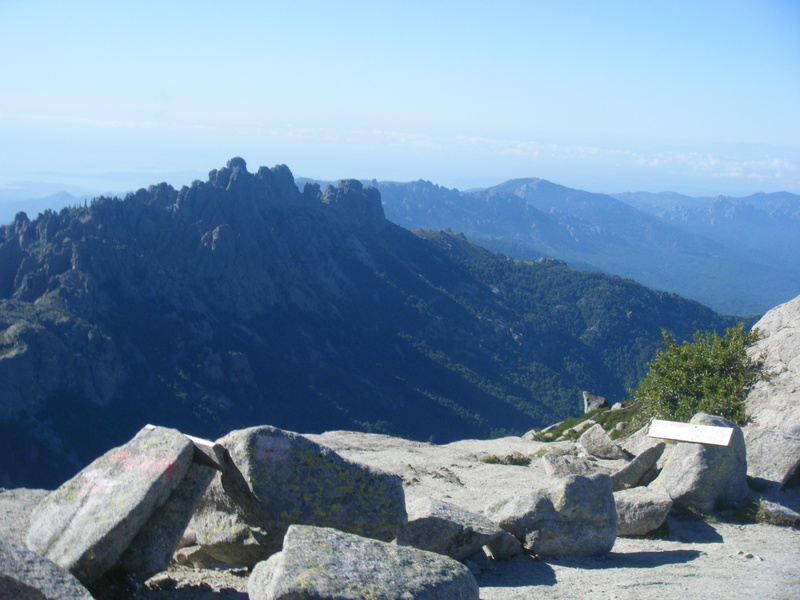 This trek is probably really simple to sort out on your own as the national park authority has centralised booking of refuges and all meals can be bought as you go along reducing the food needed to be carried. 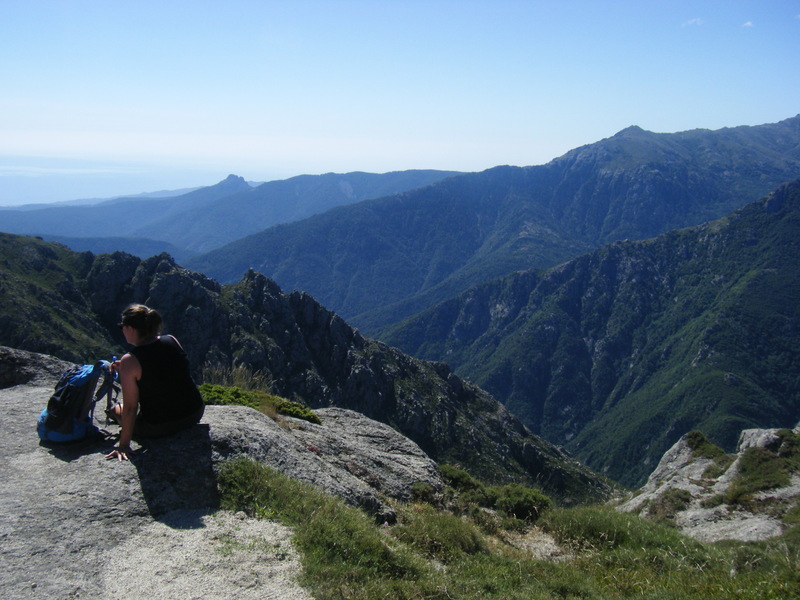 But be aware that a significant number of trekkers who do this trail independently drop out at the half way point in Vizzavona – our Corsican guide suggested as much as 60%. 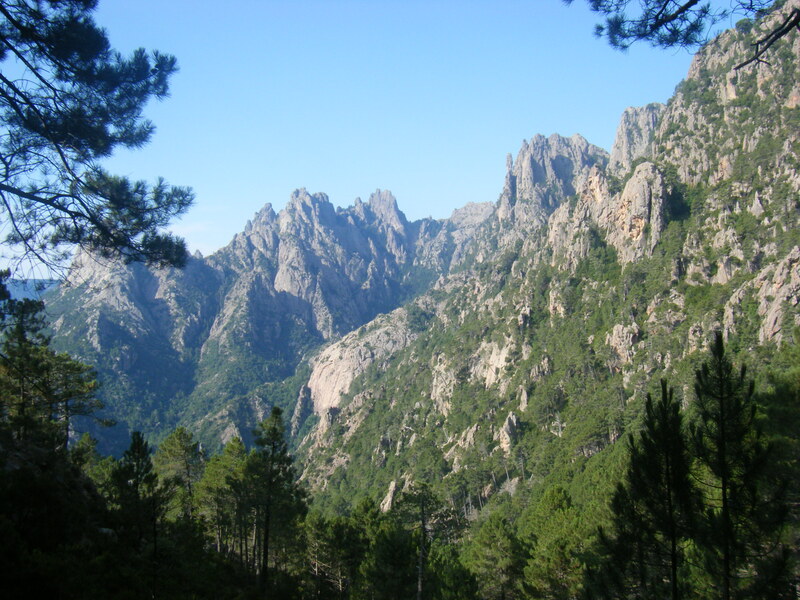 If your guide is local to Corsica they will also be able to tell you a lot about the landscape, plants and animals and history of the island. 7. Yes North to South is the typical direction most people hike the route, and while it could be quieter doing in the other direction, I believe its better to get the more difficult terrain out of the way first while you have the energy!